I always wondered what it would be like to capsize a canoe in the middle of a windswept lake and I recently got to experience it on Lake Nokomis with my good friend, Todd Nelson. I saved my tevas and backpack but lost my Canon G15 camera. 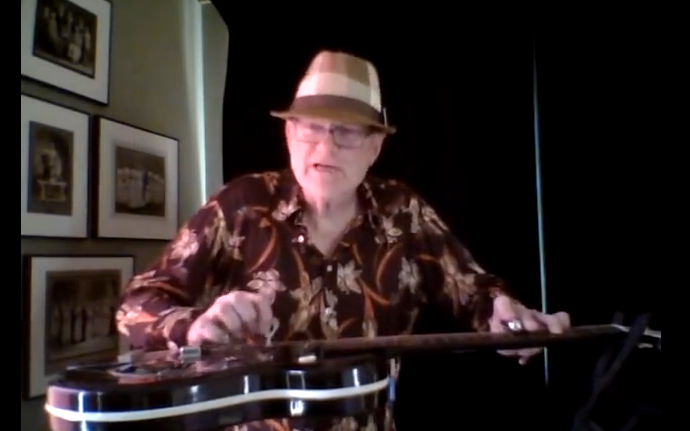 Todd saved his guitar but lost his funky hat and iPhone. The thing I liked about it was that neither of us got upset in any way; we made it to shore, emptied the canoe and finished our voyage. It was almost a pleasure to deal with the adversity, together, in a calm way. 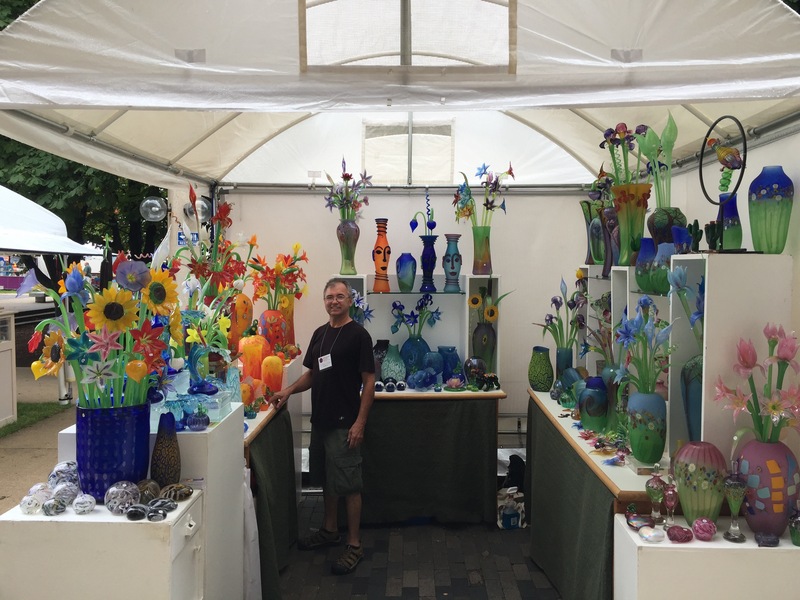 … and doing two art fairs with my friend Chris Belleau, but there is some good news and progress to share from The Buckthorn Man. Summer is the season to attack weeds and in years past I focused on pulling spotted knapweed on the sand prairie. That is until August of 2014, when I introduced both flower (Larinus minutus) and root (Clyphocleonus achates) weevils to munch on the knapweed. 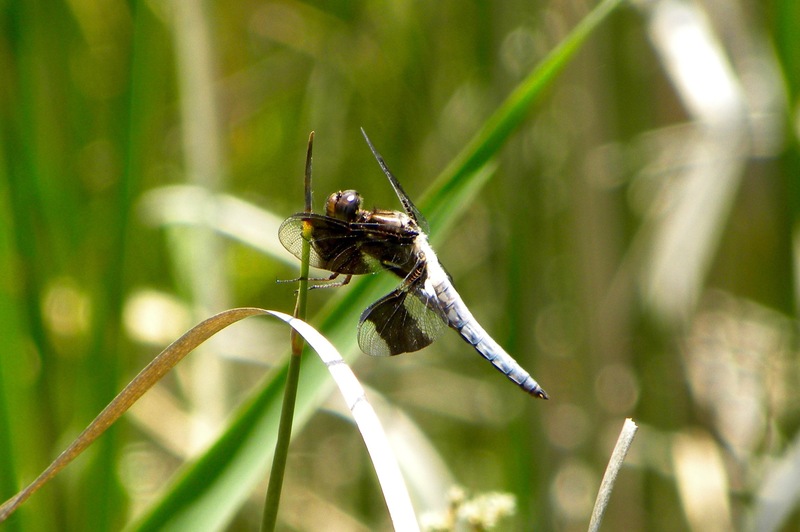 This is their third year feasting at the sand prairie and they are really getting the job done! Now, when are they going to find an effective biocontrol for garlic mustard? 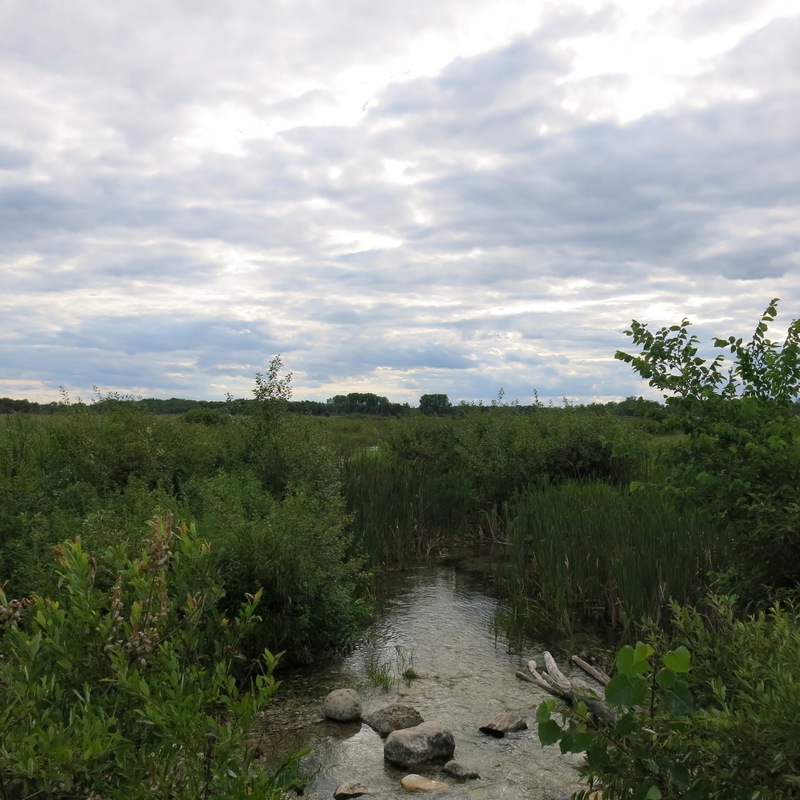 I’ve been concentrating on other weeds this summer and feeling sanguine about the prospect of significantly reducing the exotic, invasive plants, at The Springs and the Ottawa Lake Fen SNA. One of the weeds I’ve been working on is narrow-leaved cattail — in cases where it is dominating springs or blocking the main channel down the river. 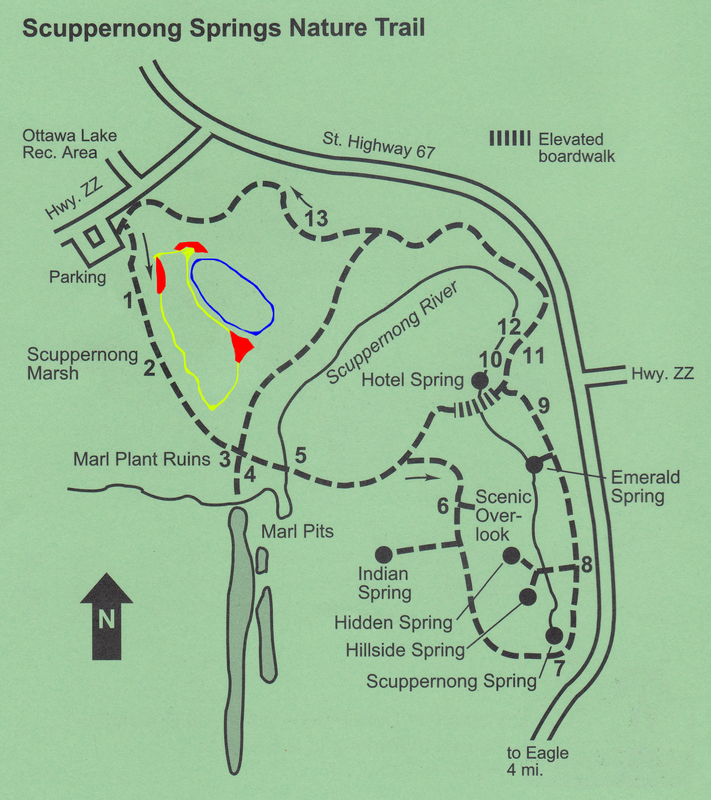 There are many springs on the east/right side of the observation deck at the Emerald Spring that were totally covered in cattails. Here are before and after views. 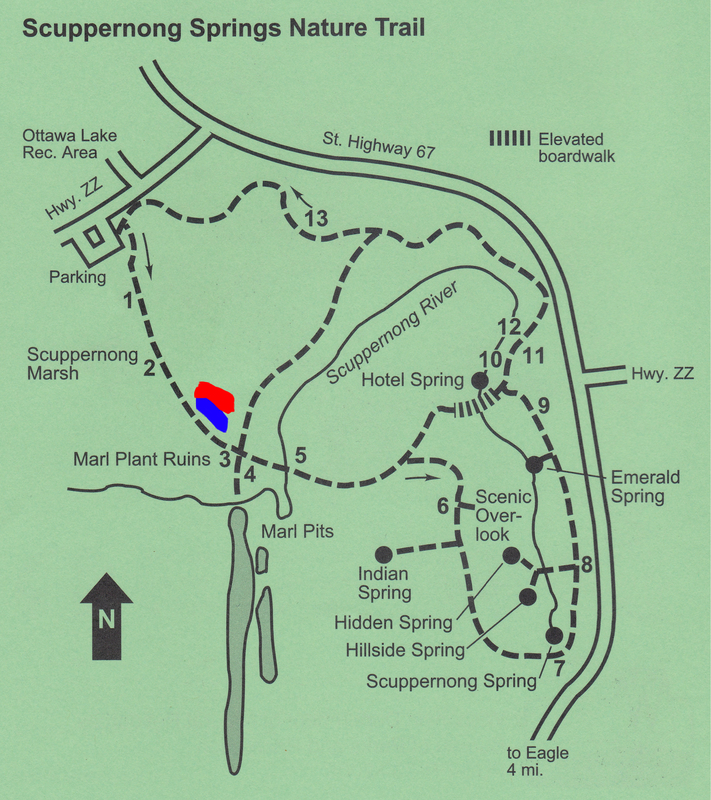 And just last week I dug out cattails and reed canary grass from the main river channel all the way from the Hotel Springs upstream to the Hatching House Springs (map here). 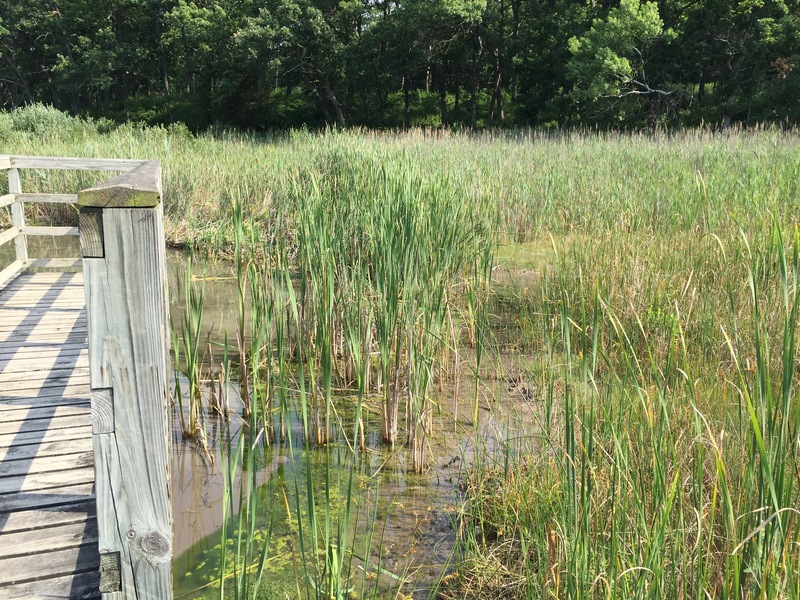 I’ve been sprucing up the river in anticipation of meeting Tracy Hames, executive director of the Wisconsin Wetlands Association, and his entire staff, for a tour of the wetlands in the Scuppernong River Nature Preserve. 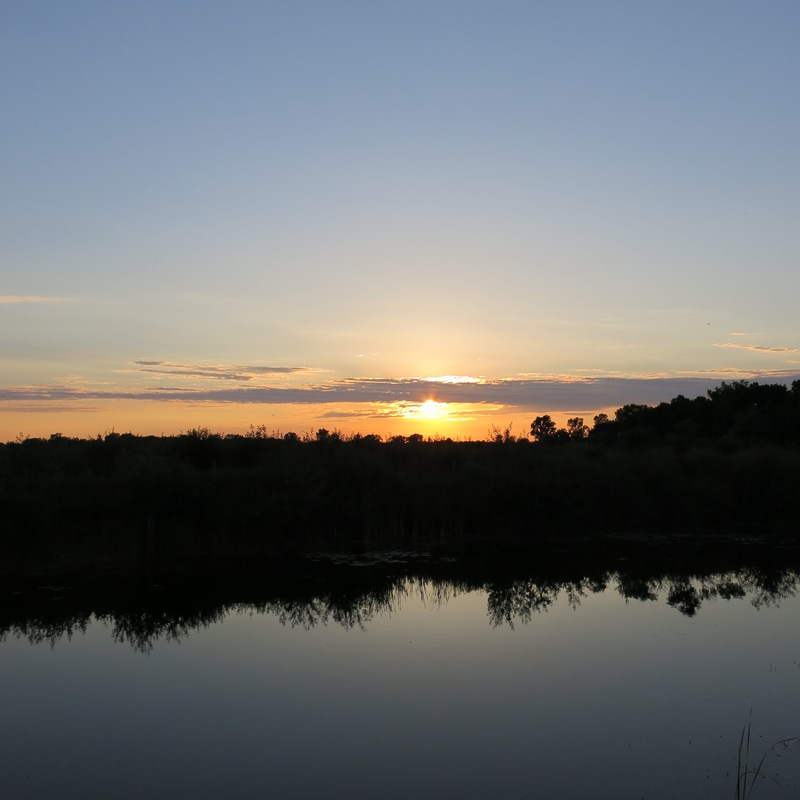 We had an excellent visit a few weeks ago exploring the wetlands that we opened up on the north end of the loop trail, and wading upstream from the gaging station bridge all the way to the Hotel Springs. Tracy suggested we cut the narrow-leaved cattails as low as possible prior to the tentatively scheduled fall prescribed burn (hopefully DNR burn boss, Don Dane, can pull this off). 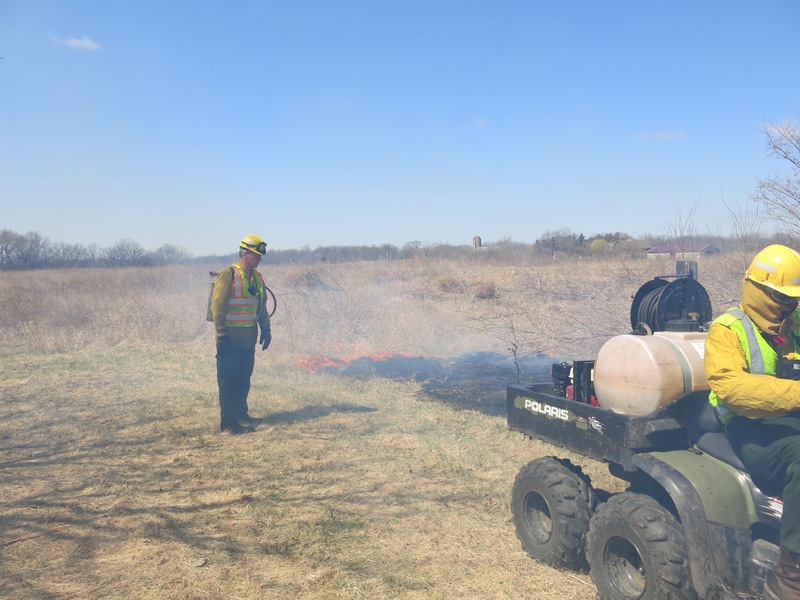 Not only will this put more dried fuel on the ground it will increase the chances that the burned tips of the cattails will be submerged under water next spring, which would significantly diminish their regrowth. Tracy also pointed out that purple loosestrife was popping up all over the place. 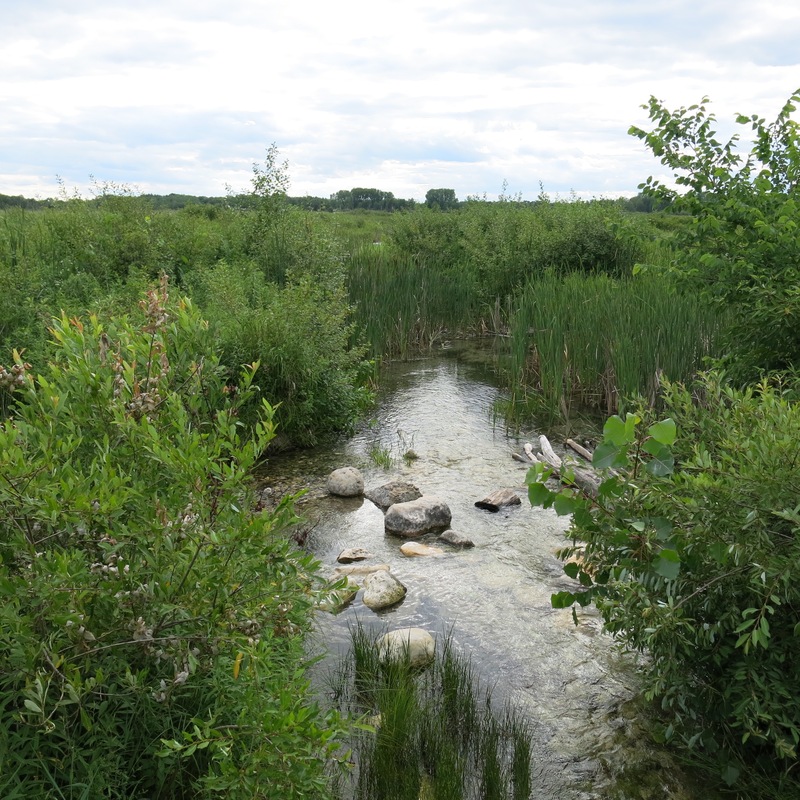 I explained that biocontrol agents for the loosestrife had been released at The Springs more than 5 years ago and that they had made a dramatic impact on the southwest border of the nature preserve. We speculated that the loosestrife beetles would find the newly emerging plants, but I’m probably going to pull all the isolated purple loosestrife I can find before they set seed — to be on the safe side. It was a real pleasure to share The Springs with such an enthusiastic and supportive group! After the meeting with Tracy and the WWA staff, I visited the Indian Springs to pull creeping bentgrass that was spreading like crazy and setting loads of seed. Here is a gallery of before and after images. I didn’t want to see all of that seed drifting downstream! I took a couple days off from pulling and collecting seed heads from canada thistle, bull thistle, sow thistle, white sweet clover and yellow sweet clover at The Springs to hang out with Lindsay Knudsvig at the Hardscrabble Prairie State Natural Area, near Hazel Green, Wisconsin. 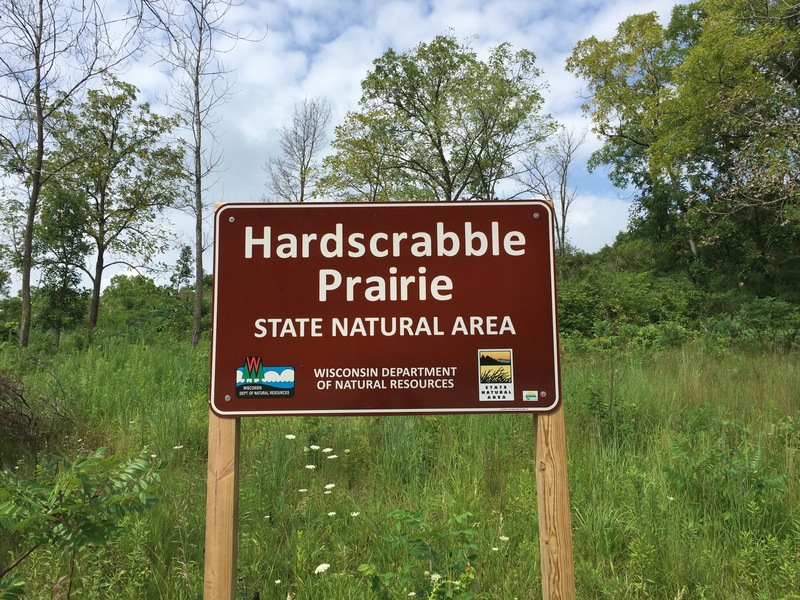 Lindsay is currently working in nearby Dubuque, Iowa and he has adopted the Hardscrabble Prairie SNA as his own. We need more people like Lindsay who care about the land, see what needs to be done, and simply do it. 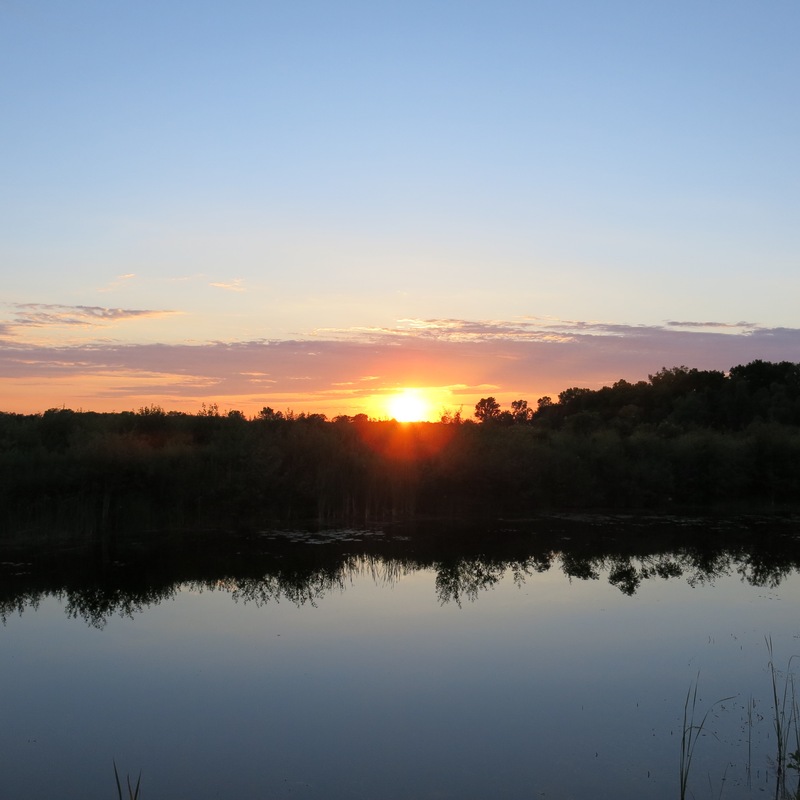 I managed to squeeze in 5 days of camping at My Shangri-La (campsite #335 at Ottawa Lake), and took advantage of the proximity to get some work done at the Ottawa Lake Fen SNA. I had not been there since May and I was amazed at how overgrown the trail from the campsite north around the fen had become. Numerous box elder and black locust trees that we girdled a few years back had fallen across the trail and black locust seedlings and weeds of every stripe had made the trail nearly impassable. Jared Urban, conservation biologist with the DNR and the main force behind the State Natural Areas volunteer program, was planning to visit so I spent two days clearing the trail and pulling weeds. 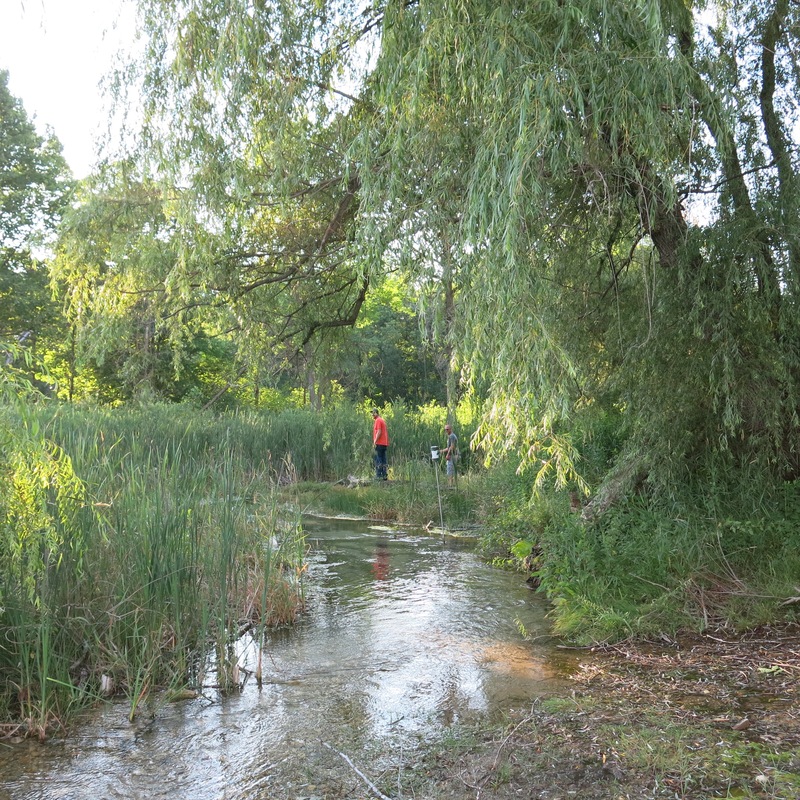 We explored the east shoreline of Ottawa Lake and took the freshly cleared trail around the north side of the fen, celebrating the progress that has been made. Jared pointed out a few weeds like Japanese hedgeparsley and teasel that were just starting to make inroads and, needless to say, I pulled all I could find. 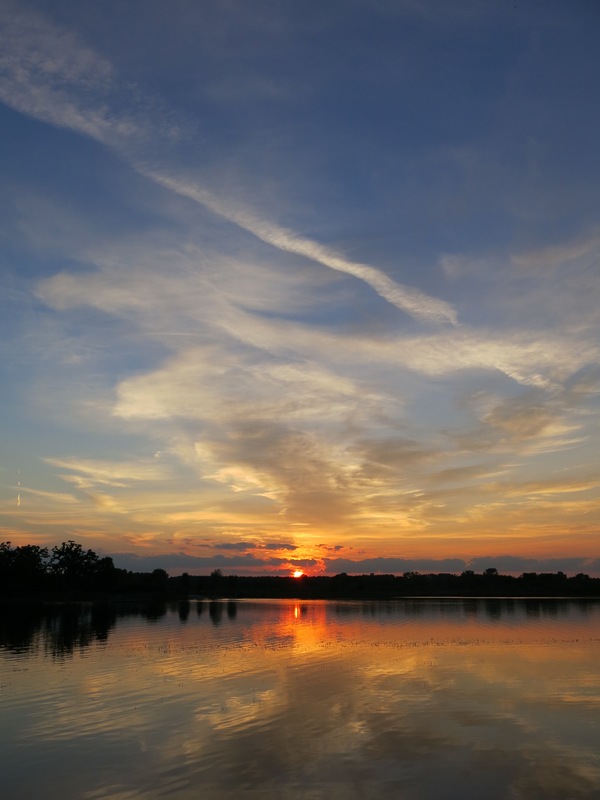 There is still a lot more weed pulling and weed seed collecting to do at both the Ottawa Lake Fen SNA and at the Scuppernong Springs Nature Trail. I started on the queen anne’s lace near the Hotel Springs and Jared tells me I’m way ahead of the DNR on this one. Well, this has been a rambling recap of the adventures of The Buckthorn Man in the Garden of Weed’in. You know, ever since he tasted the fruit of the tree of knowledge, and learned the difference between right and wrong, he has been a missionary: shining the light of truth into the darkness; pulling out the weeds to reveal the magnificence of The Creator. 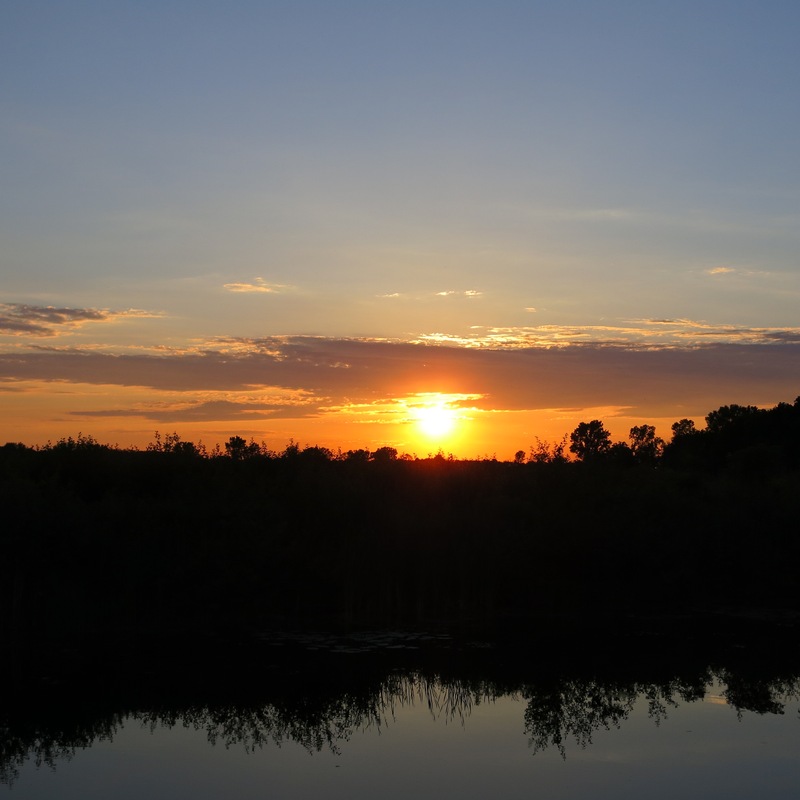 In 2013 I ran into the DNR water quality team doing a fish count on the Scuppernong River and it was fascinating. Then in 2014 I coincidentally ran into them again and documented it on my old website here. I wasn’t able to join them in 2015 or 2016, but I got the latest counts from 2016. The DNR always counts fish in the same stretch of river between the gaging station bridge and the Hotel Springs and I always see 6-8 brook trout hanging out just below the bridge that is upstream of the Hotel Springs. 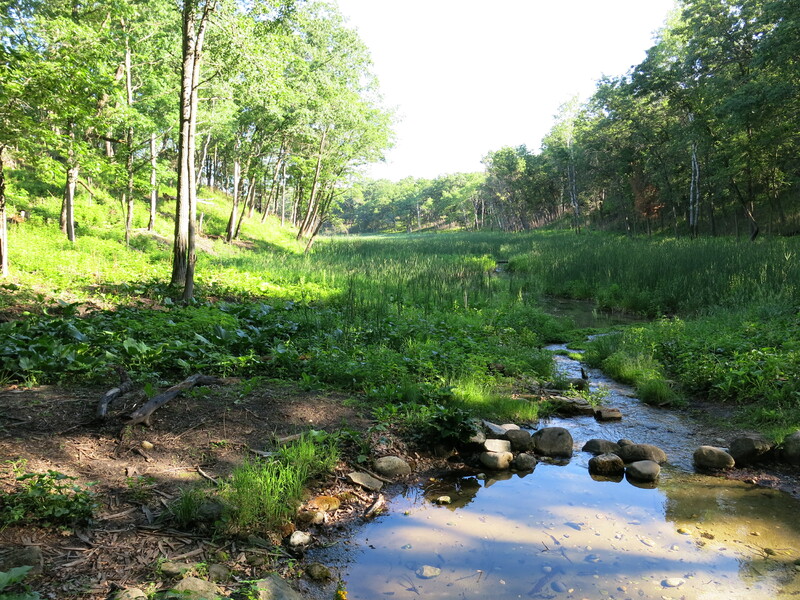 It is possible that all of the stream remediation work we have been doing has prompted a natural redistribution of the brook trout upstream of their old haunts. 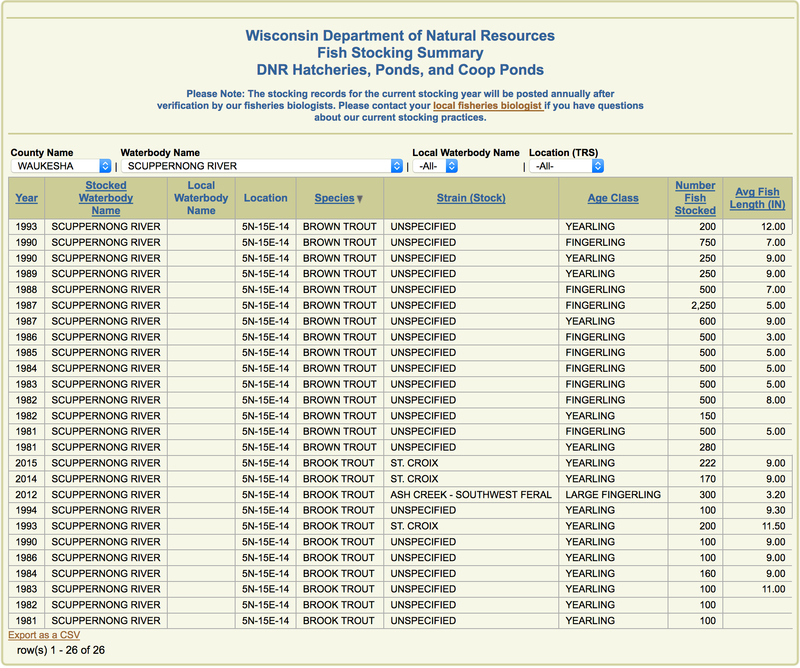 The DNR has stocked brown trout and lately, brook trout, in the Scuppernong River, so that is another factor to consider. In case you were wondering why The Buckthorn Man got so upset about the sweetheart deal the Village of Hartland secretly gave to JD McCormick, LLC to develop the Riverwalk apartment complex that I reported on last time, it’s because I happened to be reading Gustavus Myers’ fantastic History of the Great American Fortunes. In the fine tradition of John Jacob Astor, Cornelius Vanderbilt, Marshal Field, Jay Gould, J. Pierpont Morgan and Edward H. Harriman, Joe McCormick is getting rich at the taxpayer’s expense and that bugs me. I had hoped to work with the Village of Hartland to help them formulate a plan to restore, preserve and protect their environmental corridor but I found that Village Administrator and Board have no integrity and cannot be trusted. The taxpayers of Hartland gave “Poor Joe” $1,615,000 to acquire the land for the Riverwalk development and they don’t know or care, or they don’t care to know, or they know and don’t care — I don’t know. 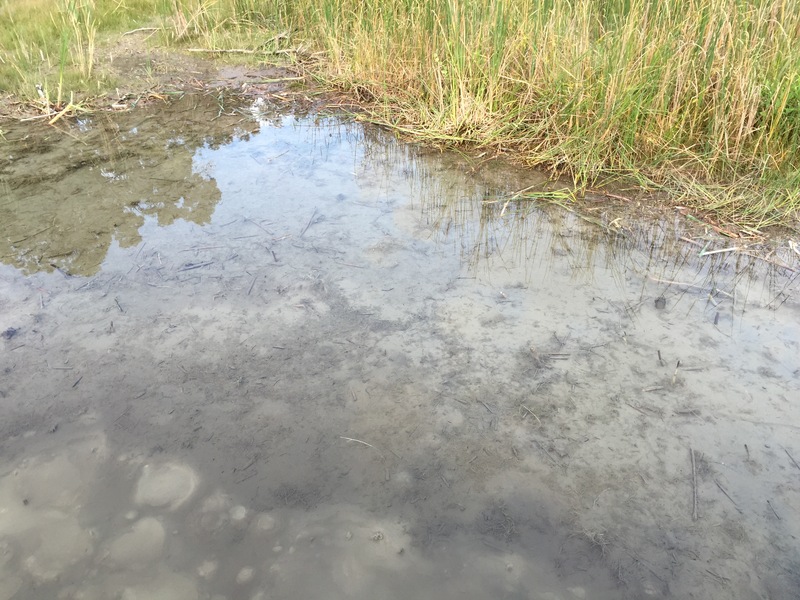 I’ve been trying to carry on at the Scuppernong Springs, but with a heavy heart, and I even organized a workday with the Ice Age Trail Alliance at the Hartland Marsh despite my disgust and disillusionment with the Village leadership. Here are a few recent pages from The Buckthorn Man‘s diary . A large patch of poison hemlock had sprung up out of nowhere near the old hotel site and I carefully mowed it down with my brush cutter. It’s been three years since I became enlightened with “organic consciousness” and I don’t spray weeds with herbicide anymore. Now I just mow and pull and try to stop the weeds from going to seed. I mowed this patch of crown vetch near the Hotel Springs. The Emerald Springs are a lovely little pool of springs but half of them were hidden under a blanket of watercress. 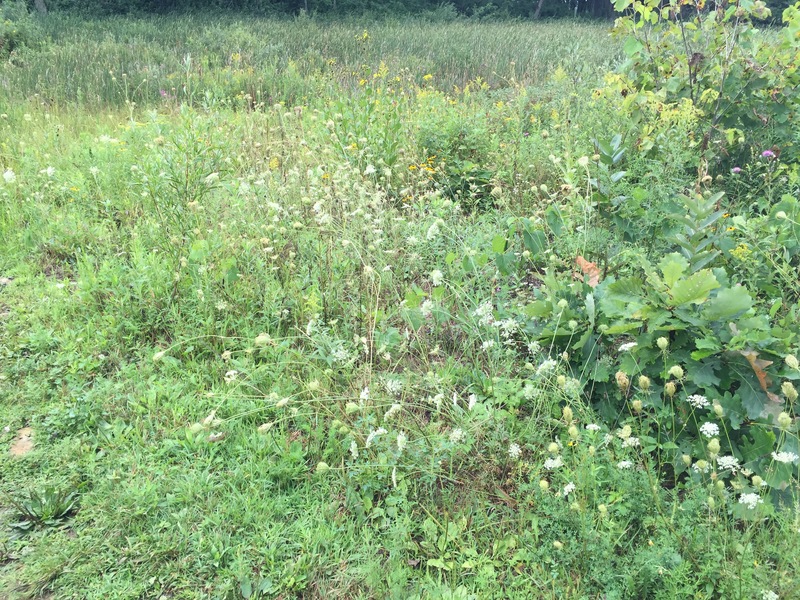 Here is a gallery of before and after shots of my weed pulling exercise. I’m not done here and plan to open up this pool and make it more accessible to ducks in the dead of winter. 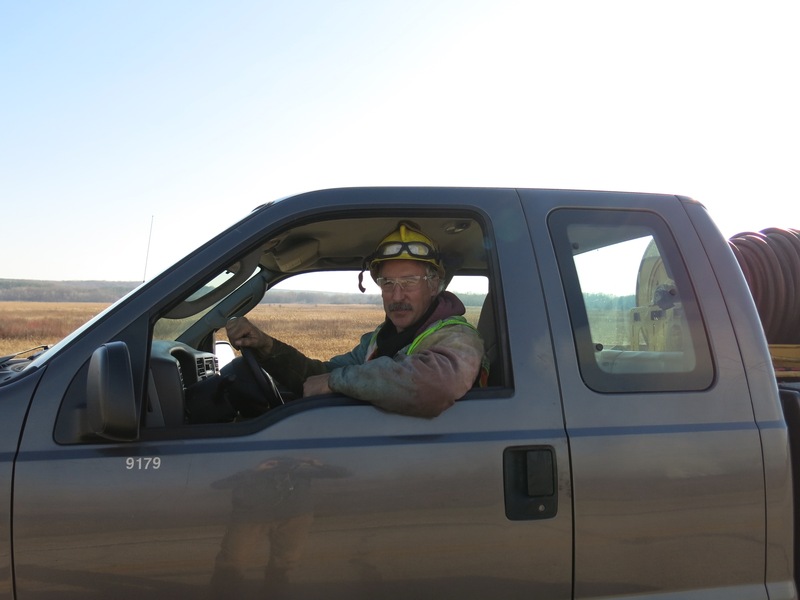 Last February we got a big assist from the DNR when Don Dane and Mike Spaight donated two days of forestry mowing to our restoration project at the Hartland Marsh. 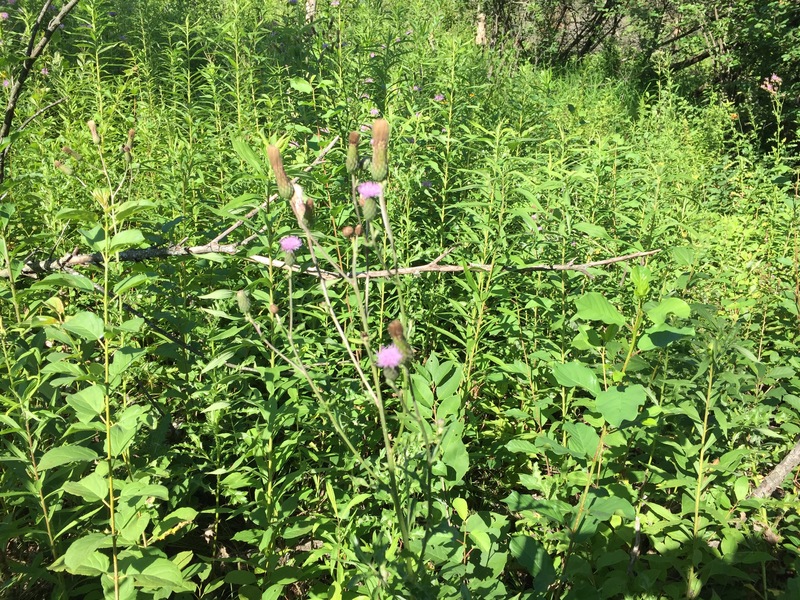 The Friends of the Hartland Marsh and members of the Waukesha/Milwaukee chapter of the Ice Age Trail Alliance joined forces in hand to hand combat with buckthorn seedlings on a very hot and steamy summer day. Back at the Scuppernong Springs, there was one last area of springs called The Hillside Springs that really needed some attention. The springs were choked with watercress. 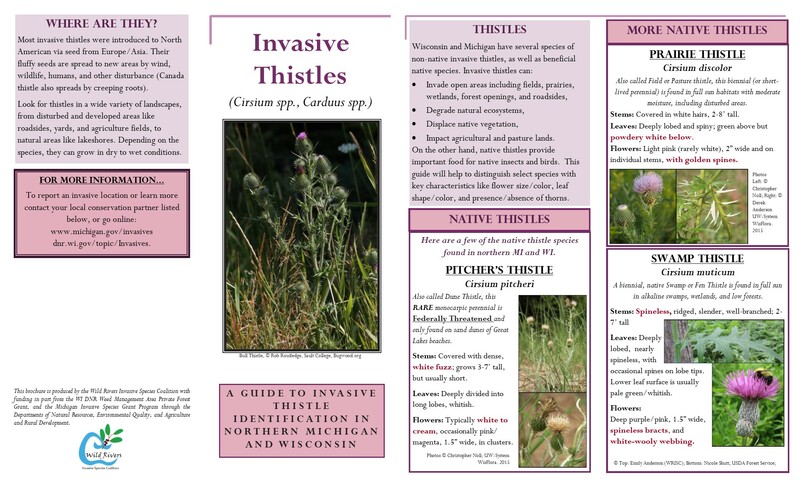 I spent the afternoon pulling Canada Thistle and I really appreciated DNR Conservation Biologist, Jared Urban, sharing the following information about native and invasive thistles. One thing that makes working at The Springs so much fun is when other people appreciate it. 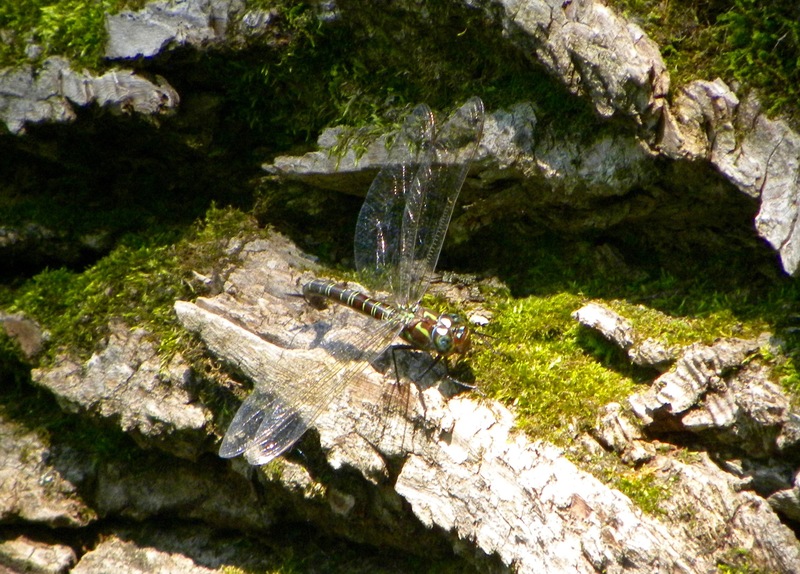 The Keepers of the Springs, John and Sue Hrobar sent me these fantastic dragonfly pictures that Sue took there. Back at the Hillside Springs there were 4, 8′ deck sections laying directly on the ground near the springs blocking the natural flow of water down the hillside. One of the decks had been damaged by fire and they were not arranged in a way that provided the best view of the springs. I had a general plan to reuse 40′ of boardwalk that had been high and dry on the main trail nearby for years, and bring the 5, 8′ deck sections over to the Hillside Springs and use them to build a better viewing platform. This would require pedestals to support the decks, like we have done in other locations, and there was a handy large dead aspen tree nearby that I planned to take down and cut up into building material. Listen as The Buckthorn Man explains his plan. 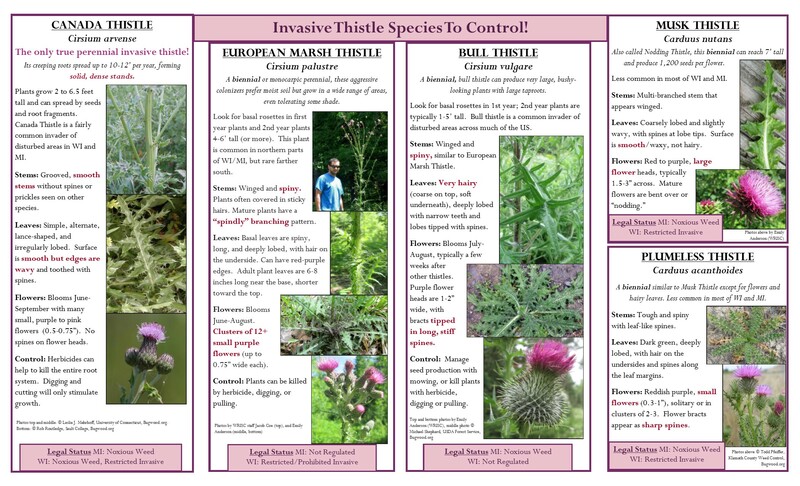 I spent the afternoon pulling Canada thistle. I mentioned to Ben Johnson that I had one goal for the year and that was to fix the decks at the Hillside Springs and he immediately responded and suggested we get after it pronto — so we did. Thanks Ben! Lindsay Knudsvig joined in the fun and we had a deck raising party! I don’t know how long these aspen logs will hold up before they start breaking down. The end of the deck makes a fine viewing platform for the surrounding springs. I stopped at the tower at Lapham Peak on the way home. I spent a peaceful and meditative day pulling thistles. 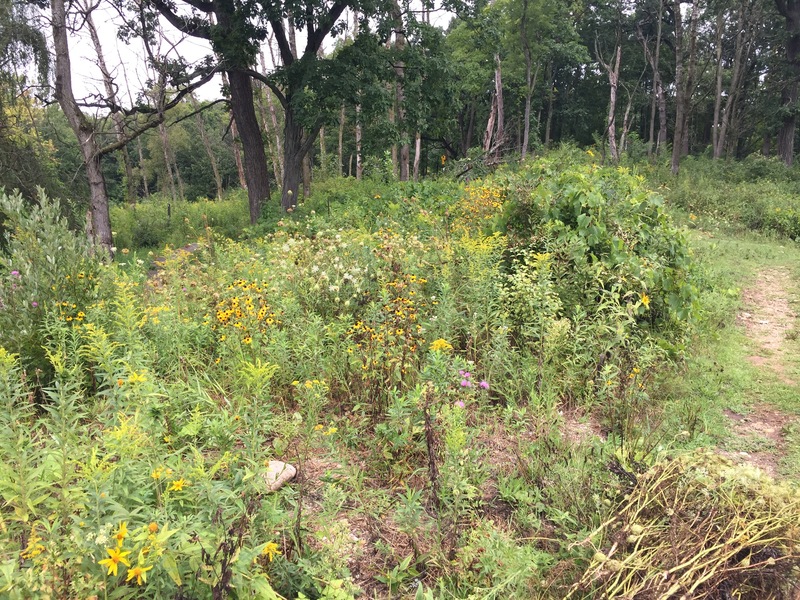 It was a very satisfying feeling to weed gardens of bee balm, aster and goldenrod of their prickly invaders. More Canada thistle pulling along with any white and yellow clover I could find. I mowed the weeds near the marl pit bridge and pulled thistle and clover the rest of the day. Another day spent pulling thistle. I really enjoyed the solitude. 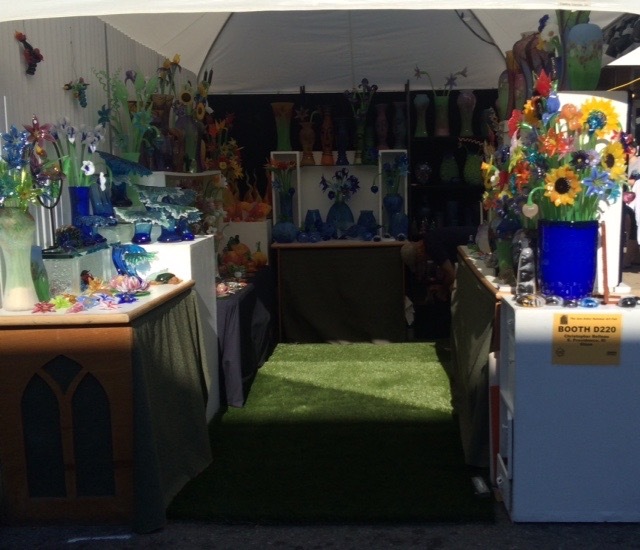 The week of July 19-25 I went to Ann Arbor Michigan to help my good friend Chris Belleau present his glass artwork at the their famous street fair. 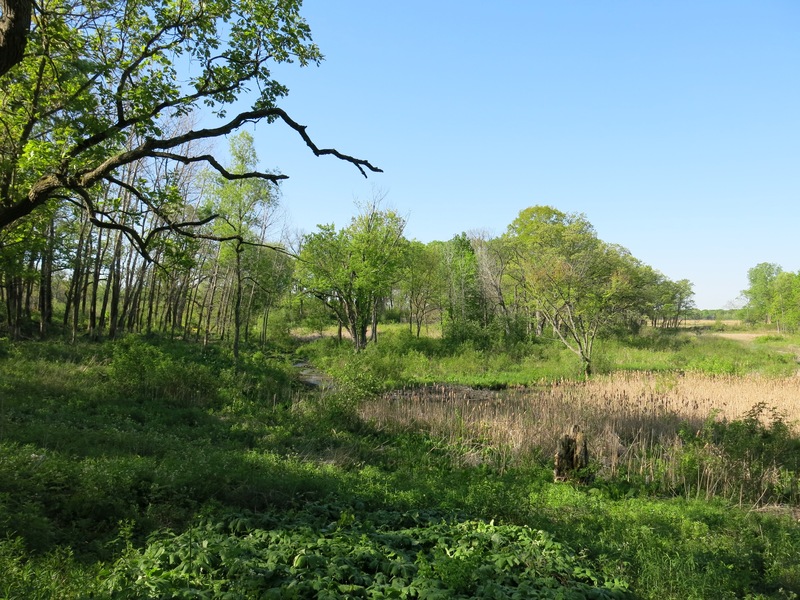 The Scuppernong Springs Nature Preserve is a crazy quilt of wetlands and uplands but the beauty of the pattern has been hidden beneath a blanket of buckthorn for years. Last winter we cleared the perimeters of three or four distinct wetland areas in the northeast section of the preserve thus creating more open “edge” habitat — the kind that bluebirds prefer. 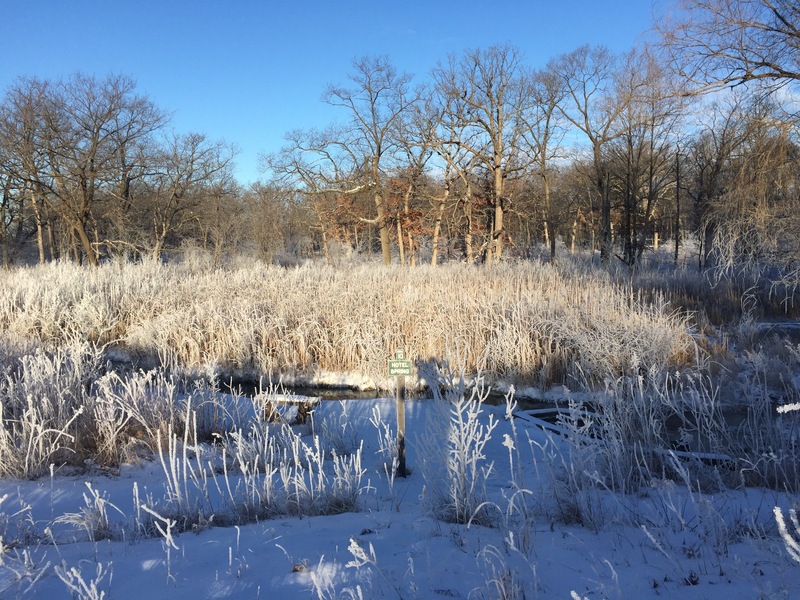 This winter we have been opening the woodland along the left side of the trail roughly between signpost #1 and #2 and this past Wednesday we arrived at the wetland across the trail from the marl plant ruins. The wetland is marked in blue below and the area we cleared is shown in red. A couple inches of fresh snow had fallen the day before and temps were in the single digits when I arrived at the Hotel Spring to get some drinking water for the day. The hoarfrost was spectacular. 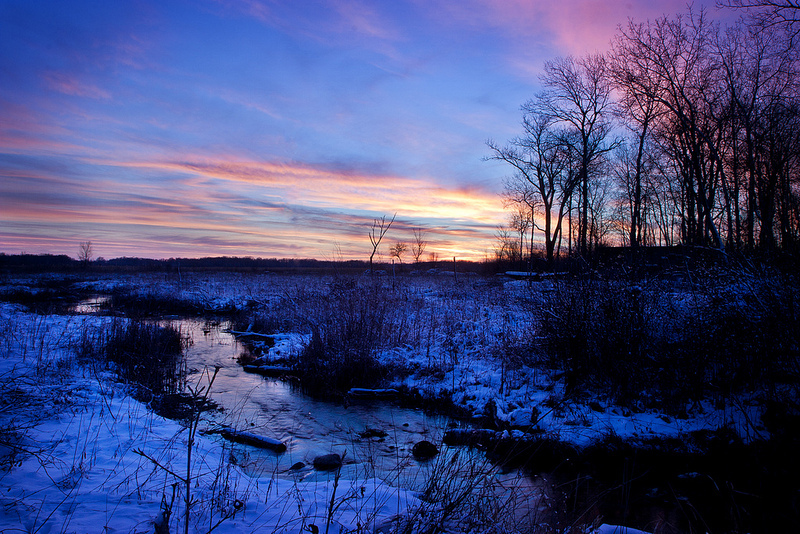 Check out this gallery of early morning pics. This was going to be my last day working at The Springs until Pati and I return from South Africa, and likely the last real winter day of the season, so I was really looking forward to it. Andy Buchta, Lindsay Knudsvig and Chris Mann would be joining me and it promised to be a very productive day. I tried to arrange the pictures with before and after images side by side for easier comparison (click any photo to open the gallery). If you subscribe to get these posts via email, you may have noticed some inconsistencies in the way that gallery pictures are delivered: sometimes they come as medium/large images, and at other times they arrive as jumbled thumbnails. I have reported this issue to the folks at WordPress… You can double-click any photo embedded in the email to view it full size on the website. 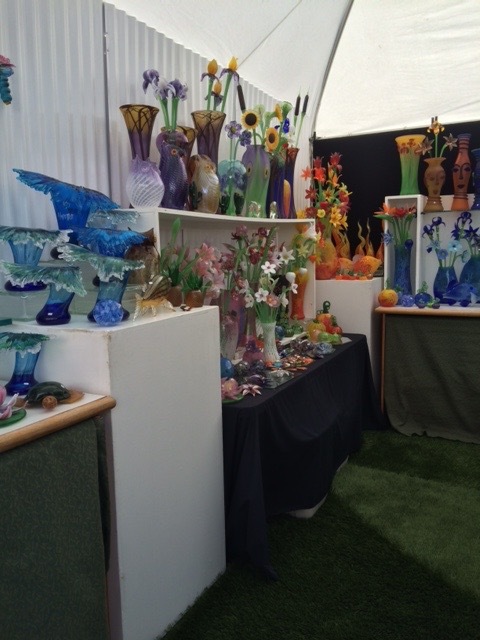 Better yet, visit the website to take full advantage of the gallery feature. And after. Those are nannyberry, dogwood and willow remaining. Andy worked up a sweat! We almost connected the open space on the north side of this wetland with the space we opened coming from the other direction back in January. 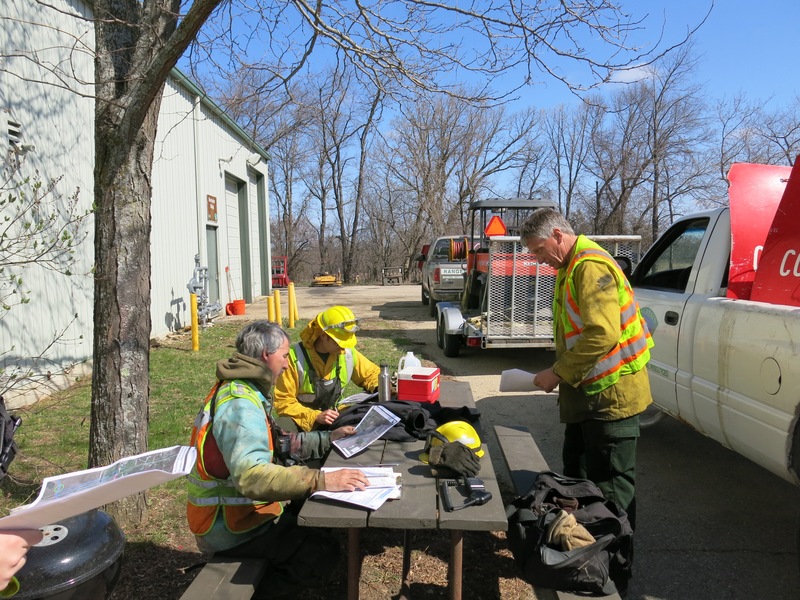 Some of you may know Paul Sandgren, the former Superintendent of the Kettle Moraine State Forest — Southern Unit, Lapham Peak Unit and Glacial Drumlin Trail — East, who was forced to retire last spring. Yes, Paul is a giant of a man. He is having a rough go of it with brain cancer. 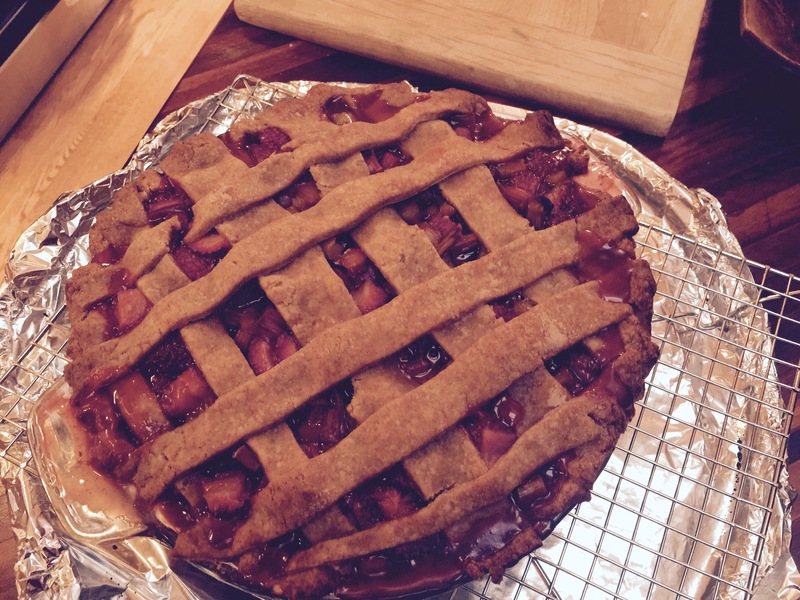 I got this update from his Caring Bridge from Anne Korman, the new superintendent. This was our plan all along…it was just a timing issue and what could not be handled at home any longer. The MRI on Tuesday at the cancer center confirmed what we suspected. Paul’s decline in the last two weeks included balance loss confirmed by the tumor growth at the back near the 4th ventricle that inhibits balance and causes nausea. The mobility loss is from the expansion of the edges of the main tumor extending more into the motor skills area. The two small tumors near the front also grew and it has spread into the right hemisphere…something we knew would happen eventually. So no infusion on Tuesday. No blood thinner shots into the belly. 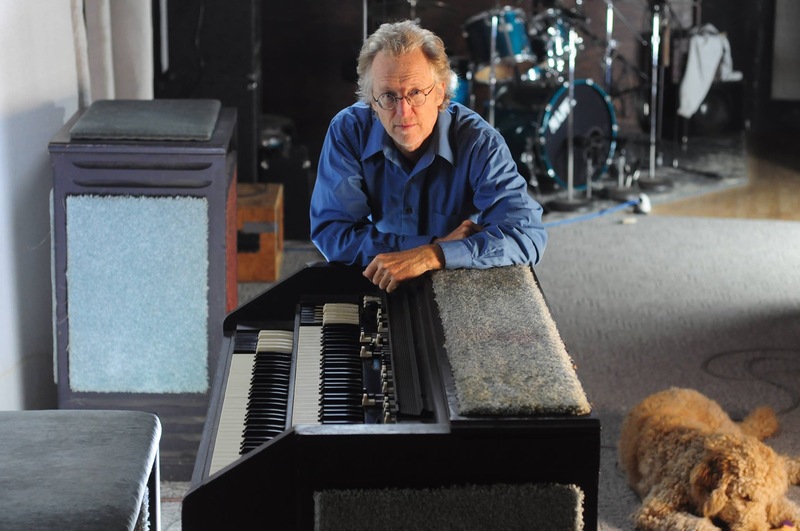 We stopped the Optune system…so he has some hair fuzz coming back. We continue with the steroid to keep down inflammation and Keppra to stave off seizures. Angel’s Grace is beautiful. 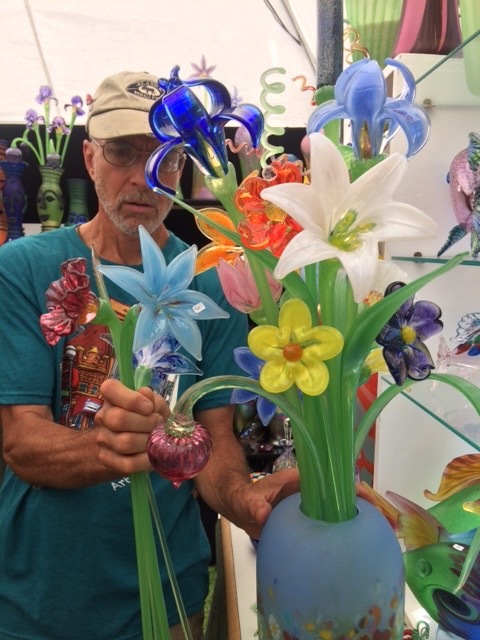 Paul, of course, is teasing all the staff–those poor unsuspecting people!!! Food is great. We recommend the French toast. Continue with thoughts and prayers. If you want to do a short visit with him there are no set hours but he may be sleeping. Even with his eyes closed, he does carry on some conversation. Of course you want to know the big question..how long. Dr. Krouwer said weeks, not months. RN Carol has been amazed at the large support system Paul has and this long length of battle time. That is by far not what the cancer team sees. Judy has been having breakfast and supper with Paul and adjusting at home this week. There are so many emotions ….some are better taken with happy hour. Oh, and speaking of that….it’s 5:00 somewhere so we are signing off for now so Judy can pack up some snacks and beverages and head back to hospice. Smile…just imagine Paul’s hair coming back with a little red tint!! See you at Bluff Creek West on March 12! Time was running out at The Marsh. Since I punted back in 2011, the Buckthorn’s offense had rallied back to take the lead and we were stymied by their impenetrable defense. Ice Age Trail Alliance coach, Kevin Thusius, got the call from the booth: offensive coordinator, Village Administrator Dave Cox, said the only hope to save The Buckthorn Man’s efforts was a “Hail Mary” pass. Kevin looked to the bench for the DNR’s special teams players Don Dane and Mike Spaight, who hadn’t seen action in the game since last March. Don, the wily veteran, called timeout. He suggested we rent an ASV machine, mount a DNR forestry mower head on it, and then throw it to Mike, waiting upland in the end zone. 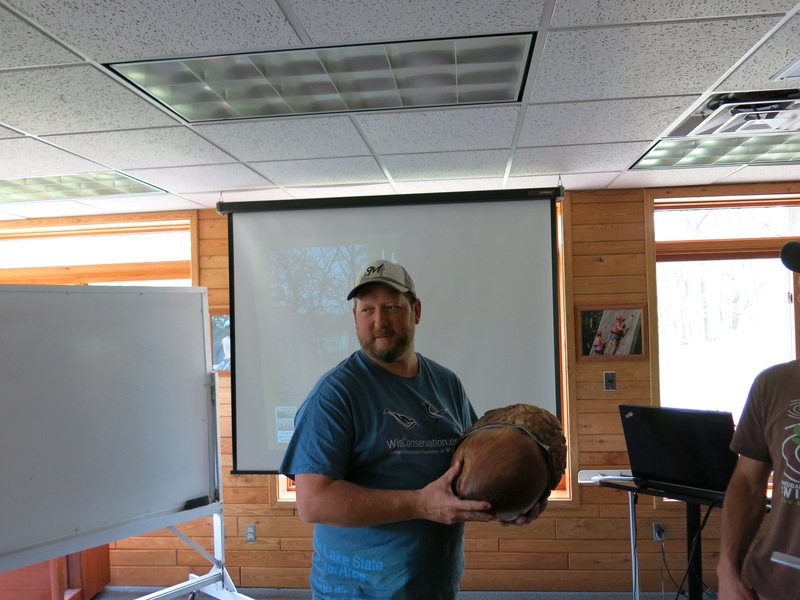 As the last seconds ticked off the clock, I snapped the ball to Don and blocked the rushing buckthorn, holding them off just long enough for him to get the pass in the air. Mike, surrounded by a thorny thicket, caught the ball and mowed the defenders down as he cleared a path into the end zone. Here is a look at the field before the big play. Note that you can open the gallery and see the pictures full-size by clicking on any of them, or, you can hover your mouse over a picture to read the narrative in the description. Here are a couple examples of how thick the buckthorn was becoming. A dense thicket of buckthorn on either side of the trail. Conditions were perfect for forestry mowing. 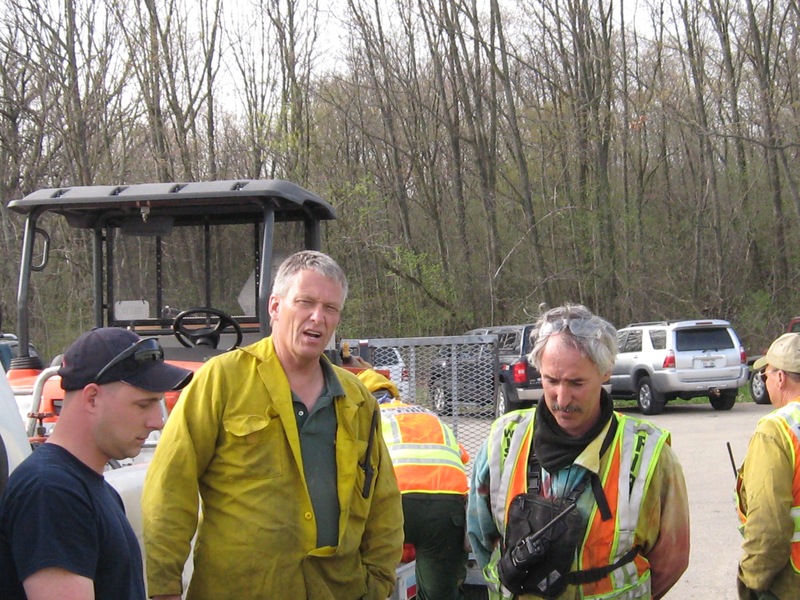 I was working at the Scuppernong Springs this past Monday when Don called to say that he had lined up the ASV machine and they would be ready to start the next day. 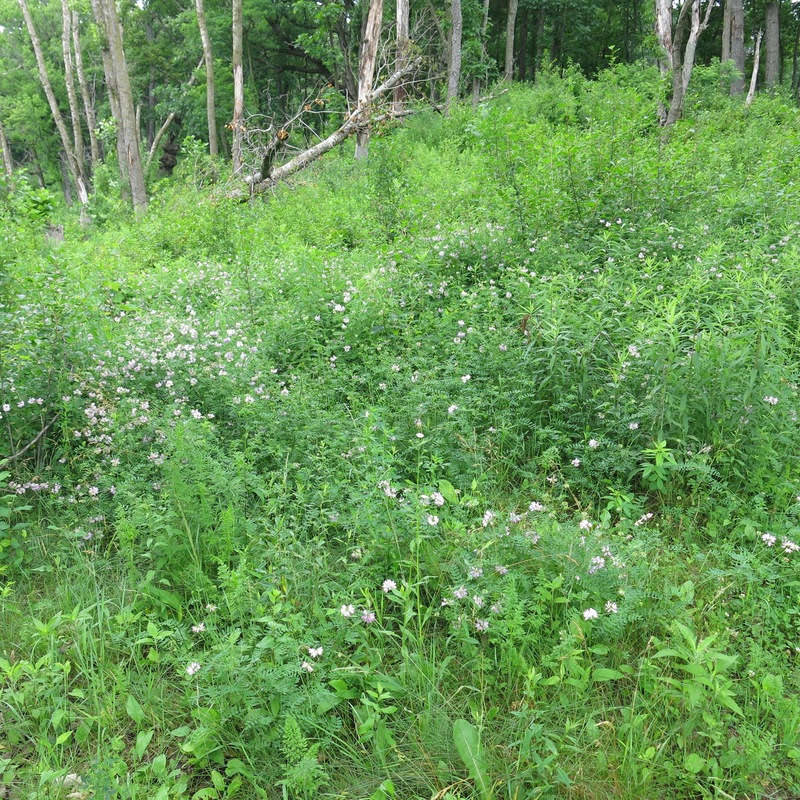 We had just enough funds left in the kitty, contributed by the Village of Hartland, and we had made the decision that its best use would be forestry mowing; that was a good call, as you can see by the amazing and outstanding work that Don and Mike accomplished. But our dance in the end zone will be merely a gaudy display if we don’t get more funding to treat the cut stubs. We are debating whether to do a basal bark treatment before they get covered with snow, Don’s recommendation, or, wait until the cut stumps bush out in the late spring to treat them with foliar herbicide spray. In either case, we don’t have any money right now. We’ll get flagged with a penalty, and the touchdown will be called back, if we don’t come up with something. Here is a map showing the area they mowed in blue, followed by an “after” gallery displaying the results. Recall the picture of Kevin, Marlin and Rachel above, this is what the background looks like now. Looking back east at the south side of the Village land. The preservation, restoration and protection of the primary environmental corridor in the Village of Hartland is too vitally important to leave in the hands of ad hoc groups of volunteers, especially when considering that the Village is one of the primary land owners in the corridor. Our Political “law” is nothing but the arbitrary WILL OF MEN and WOMEN. Government exists to direct and control our minds; the “State” is a figment of our collective imaginations. On one hand, I’m challenging the legitimacy of the government’s claim of “authority”, and on the other, I’m asking the Village of Hartland — the powers that be, who “speak the law (exert jurisdiction)”, in these parts — to step up and take leadership. You can rightly question the sanity of The Buckthorn Man: is he schizophrenic, or just pragmatic? I’m still trying to sort out the meaning of Village Board President David Lamerand’s response to my presentation and I have confidence that the Village will act in good faith to address the concerns I have raised. You can listen to an audio of my presentation to the Village Board on January 25, here, beginning at the 5:55 mark. Thanks to the Village Clerk, Darlene Igl, for providing the audio. It has been an exceptionally benign winter so far, perfect in every way for cutting and burning buckthorn in the forest. On Thursday, January 28, I was joined at the Ottawa Lake Fen SNA by Andy Buchta and Ben Johnson. We had a flawless day continuing to open up the views to Ottawa Lake from Hwy 67 and the SkyDance Pet Lodge parking lot. We lit 5 old piles and made three new ones. I feel priviledged to be the caretaker/steward, along with Pati Holman, of this beautiful property. On Monday, February 1, I was joined at the Scuppernong Springs Nature Trail by Andy Buchta and Lindsay Knudsvig in the morning, and Ben Johnson later in the day. 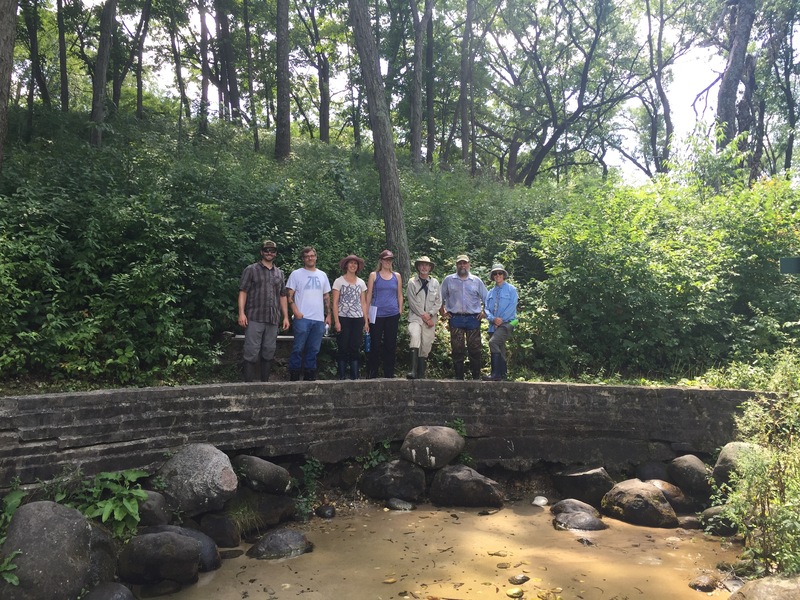 Thank you all for volunteering your time and energy to restoring our Kettle Moraine treasure! Lindsay, just came off working 4 night shifts in a row! Here he preps the first pile. 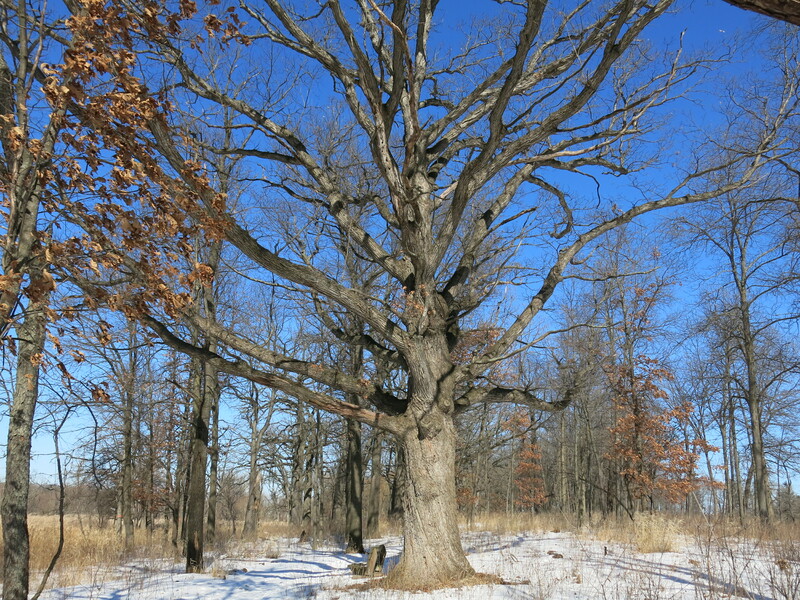 Before image of a huge red oak. Here is that red oak again. A couple of other oaks we opened up. Later that evening, around 6:30pm, as Ben and I were tending the fires, I happened to be looking to the east through spreading oak branches at Orion’s belt in the sky. Just then a bright light emerged and I called out to Ben, “Look!” and we both watched the meteor expand into a huge white ball before it disappeared at the horizon. I’m looking forward to joining my friends at another State Natural Area Workday at the Whitewater Oak Opening on February 13. After a long hiatus, The Buckthorn Man has returned, chainsaw in hand, to The Scuppernong Springs Nature Trail. 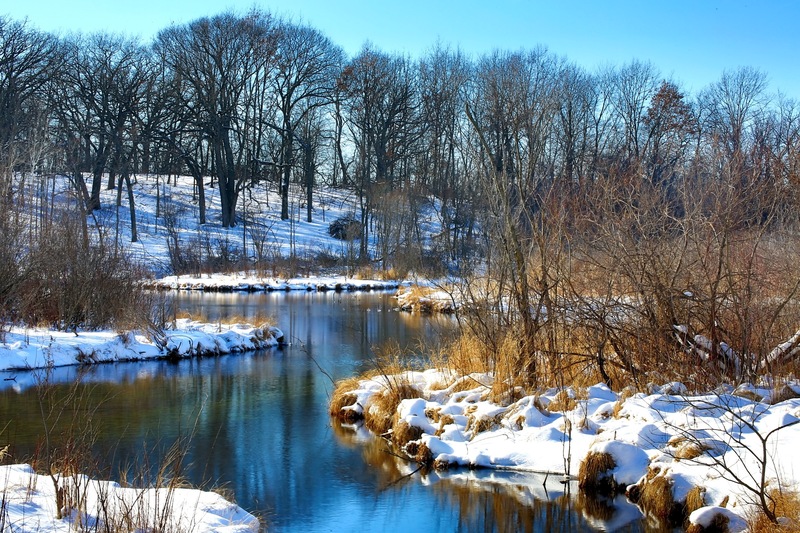 The winter of 2014-2015 was one of relentless attack on the bane of the Kettle Moraine and by the time I quit cutting there on April 1, 2015 my reservoir of aggressive energy was exhausted. I took solace in the Alchemy At The Springs wrought with Stihl and Sweat: “Out of Darkness, into Light”. 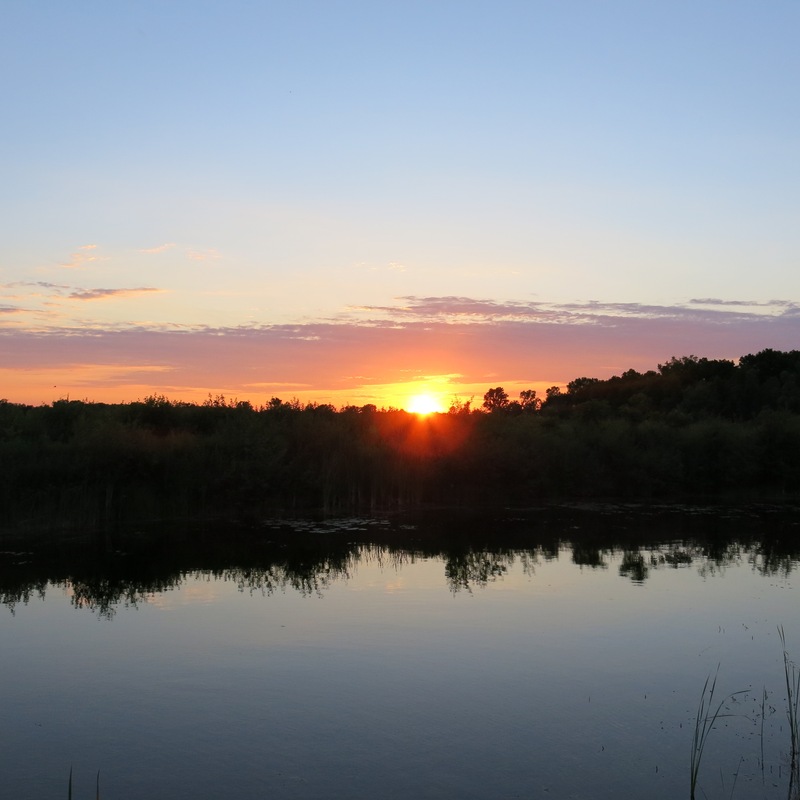 There is light at the end of the buckthorn tunnel at The Springs and, with a little help from my friends, we will resolve the dissonance of buckthorn into the consonance of prairie, woodland and meadow. The Buckthorn Man recorded this video on new year’s eve while standing on the west end of the buckthorn alley. 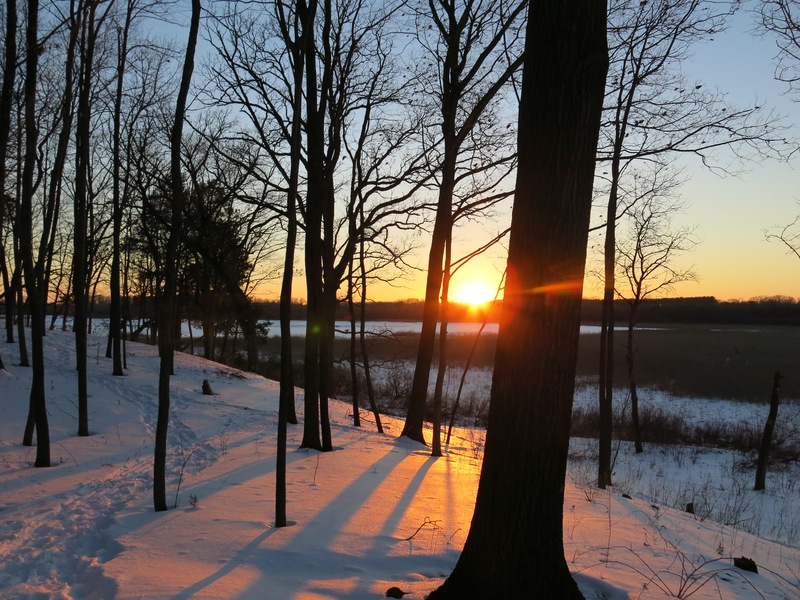 Therein I sketched out a plan for this winter’s cutting season describing burning snow covered brush piles and shining a light into the darkness of the buckthorn thicket. A resolution is the act of analyzing a complex notion into simpler ones — the act of answering or determining — and I think I have an excellent approach to cutting buckthorn this year. We are going to focus on the area outlined in yellow on the map below. 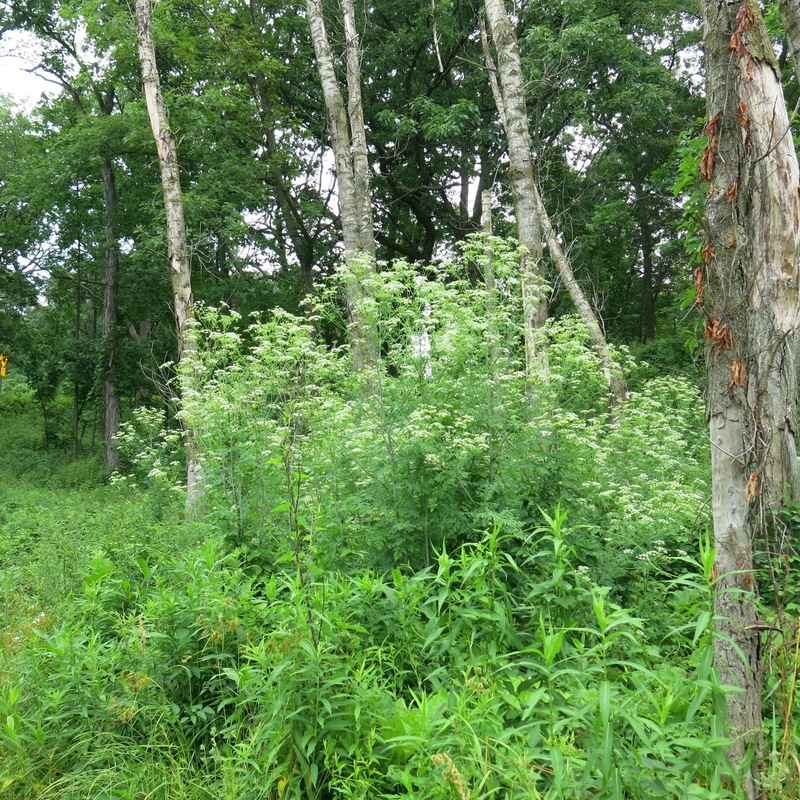 This is the last upland area within the loop trail that is still covered by a buckthorn thicket and I don’t think more than a handful of people have threaded their way through it recent years. The areas in red above mark the three locations where we cut buckthorn in the last week. The blue circle indicates a large wetland area that is relatively open. I am going to focus on clearing the area within the yellow circle this winter and just see how far we can get. Each workday will consist of: picking a central location among the buckthorn to start a fire, digging a hole in the snow, cutting and collecting standing dead buckthorn, lighting a fire, and finally, feeding the fire with the surrounding freshly cut buckthorn. This is the approach that The Friends of Lapham Peak (and many others) use and I have found it to be very efficient and effective. So, if you are looking for something different to do on a cold winter day, watch my Upcoming Volunteer Events calendar feed on the Home page, or, better yet, subscribe to my volunteer workday events calendar via the Volunteer page, and meet me at The Springs or any of the other excellent places where I volunteer. On new year’s eve day Andy Buchta joined me and we had a fine day cutting and burning in the topmost area marked in red on the map above. Thanks Andy! I knocked off as much snow as possible and then “dug” into each pile with the chainsaw and stacked the wood for lighting. On Sunday, January 3, I returned to work in the area marked in red on the right on the map above. 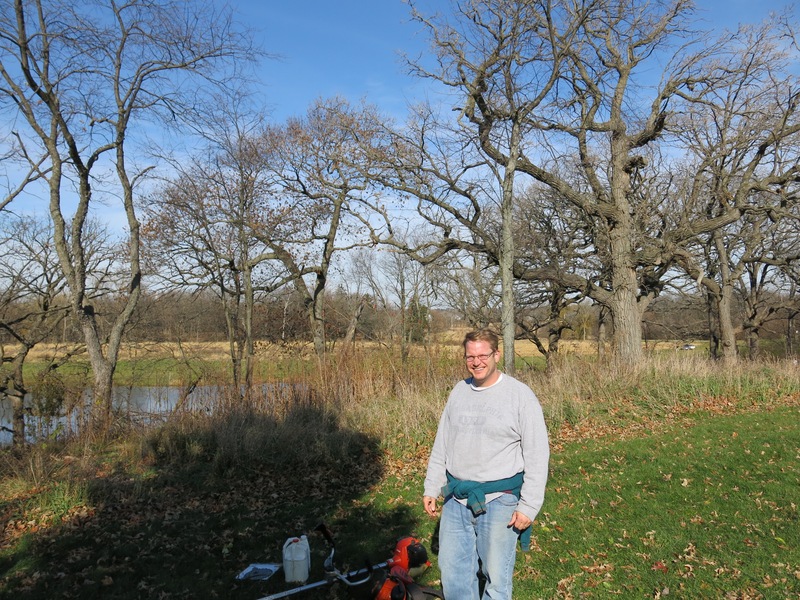 During our recent workday with the Southeast Wisconsin Trout Unlimited group on the Scuppernong River, DNR Fisheries Biologist Ben Heussner suggested we return to the area when there was snow cover and transport brush piles over to the river to use to backfill behind the biologs we installed. 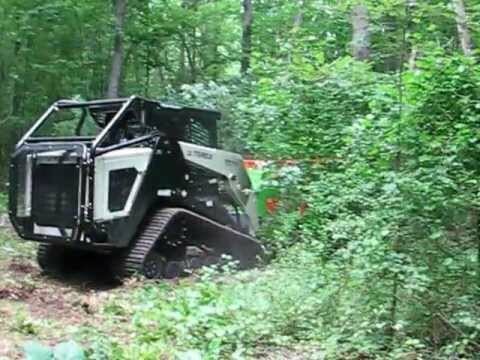 That is what The Buckthorn Man is discussing in this video. I realized then that my original plan to burn all the brush piles there was no good, instead, we should make new piles and burn fresh buckthorn. It’s hard to believe that a liar like The Buckthorn Man could have any friends, so I was a little surprised, and it warmed my heart, when Andy Buchta, Lindsay Knudsvig, Ben Johnson, Joe Winn and Chris Mann showed up to help me. We had a great time, got a hell-of-a-lot of buckthorn cut, and revealed 5 or 6 large burr oaks and a cluster of 4 huge black oaks that you can see in the background of the group shot below. Lindsay arrive shortly after I did and we got the first piles set and lit. Clearing buckthorn to expose an oak tree is what it’s all about for me. We got to do it again on Tuesday, January 5 when Andy Buchta joined me in the third area marked in red on the lower left of the map above. 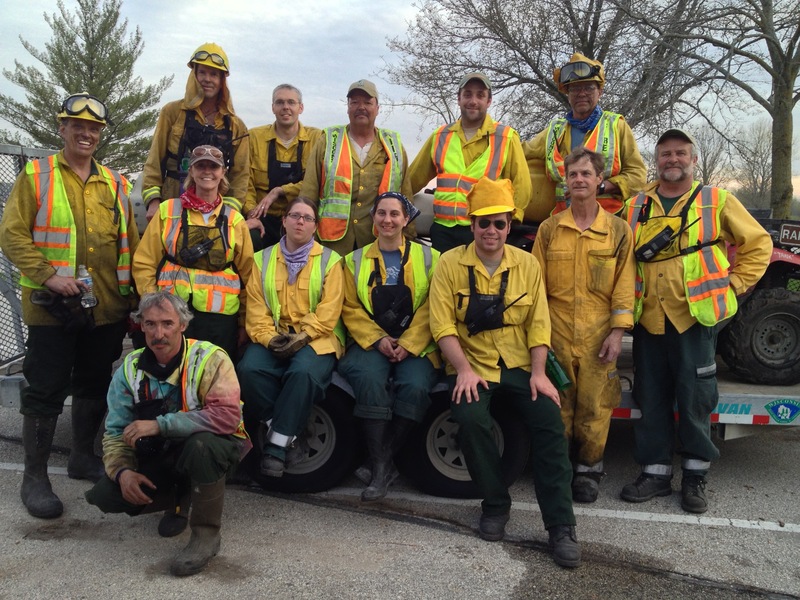 I scoped out the worksite and identified three spots to make fires and we got after it. The weather reports on the nightly new have been sounding the alarm that “bitter cold” temperatures are coming — be very afraid. Nevertheless, I did appreciate the bright sun and comfortably warm conditions on Tuesday while cutting some monster buckthorn trees. The highlight of the day was uncovering 3 relatively young burr oaks. Can you pick out the three burr oaks? 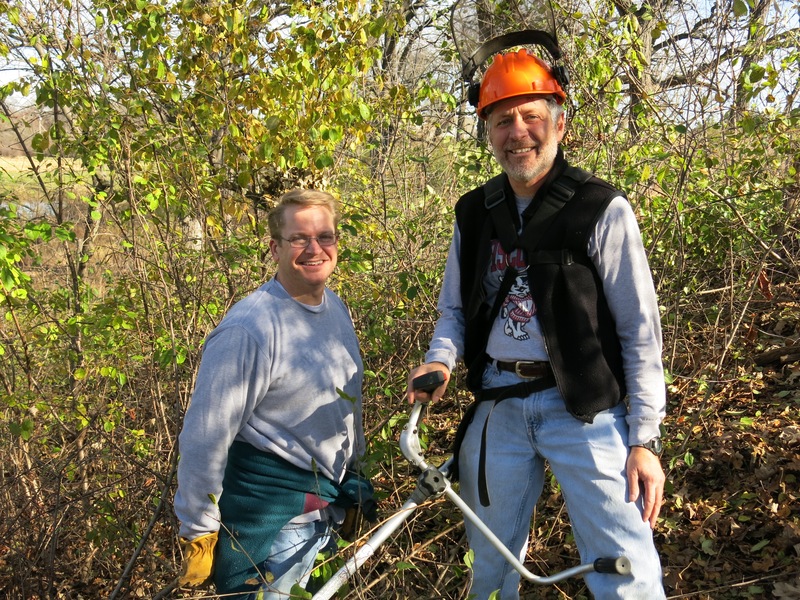 I’m looking forward to joining my friends Zach, Ginny and Jared on Saturday, January 9, at Bluff Creek East to continue clearing buckthorn from around the springs that form the headwaters of the creek. 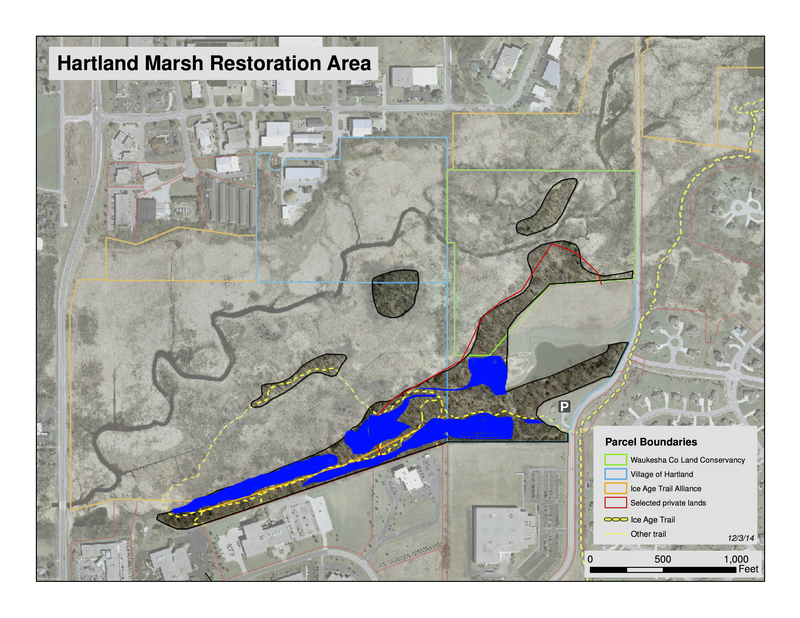 Join me at the Village of Hartland Board meeting at 7:00pm on January, 25 at 210 Cottonwood Ave. in Hartland, where we will be discussing the The Village of Hartland Comprehensive Development Plan: 2035 (See the Hartland Marsh project page for more details). 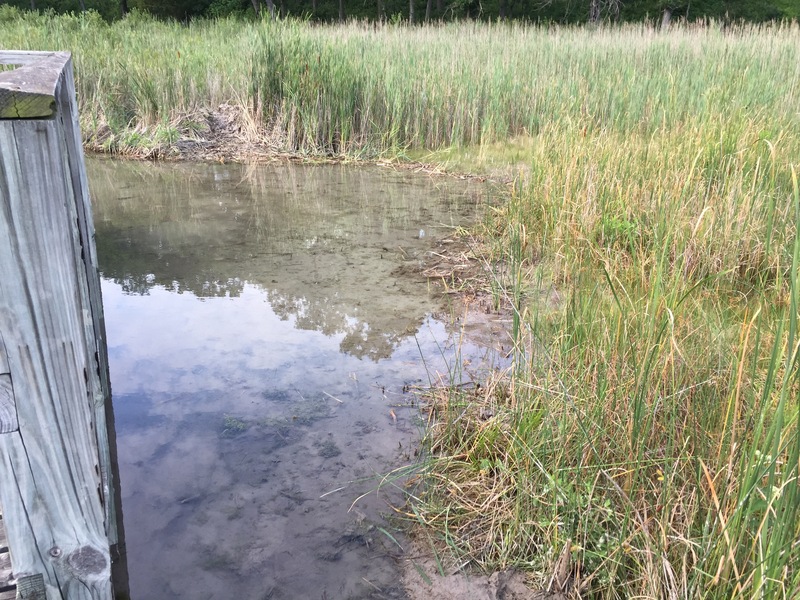 Eric Tarman-Ramcheck has been on his new job as a Conservation Biologist with the Wisconsin DNR for over a year now and he is definitely making his impact felt. 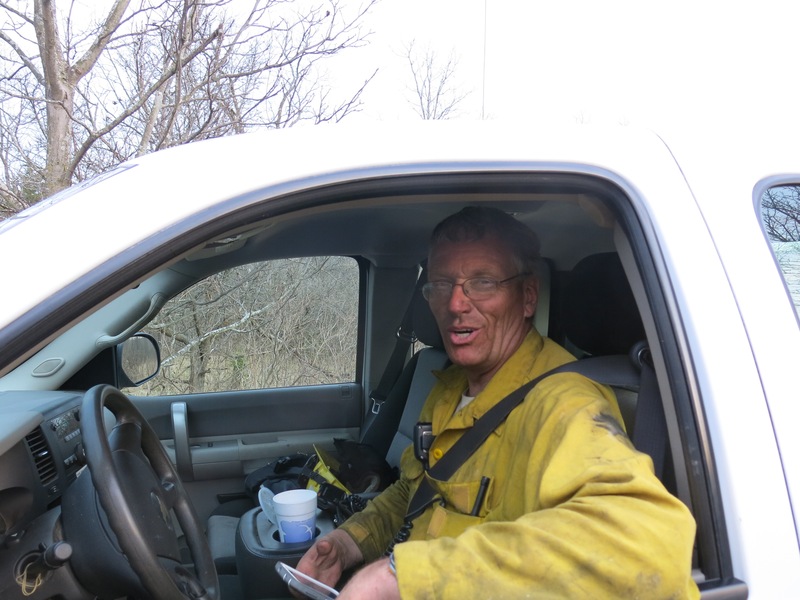 Eric works out of the Kettle Moraine State Forest — Southern Unit and he is as handy with a pen as he is with a chainsaw. 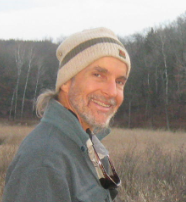 He recently submitted a North American Wetlands Conservation Act (NAWCA) grant proposal for the Scuppernong River Habitat Area and the Ottawa Lake Fen State Natural Area. 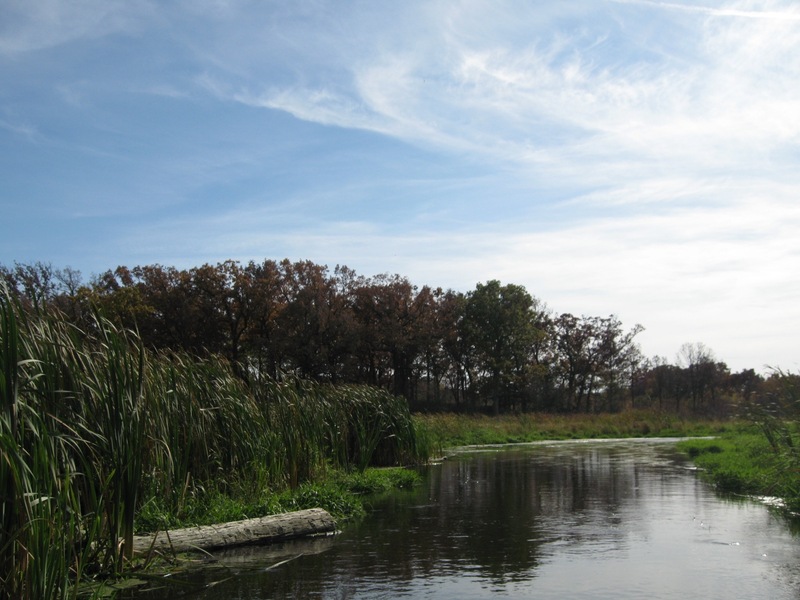 If you have been following the adventures of The Buckthorn Man, you will recall that I participated in the 2013 Phase IV NAWCA grant for the Scuppernong Springs Nature Preserve and the Scuppernong River Habitat Area. 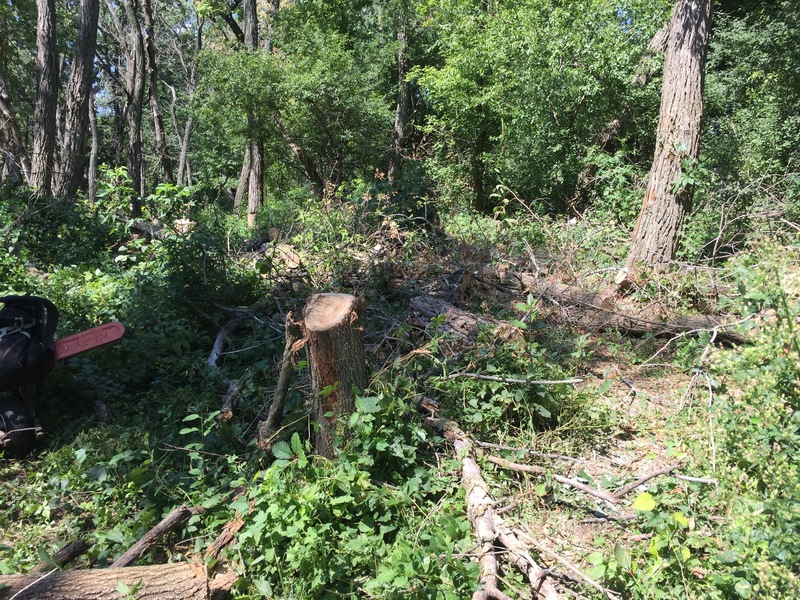 The Buckthorn Man was on the hook for $37,500 worth of labor at $15/hour and, along with help from my super friends, we actually contributed over $80,000 worth of labor over the 2 year grant period. I’m proud of our contribution and very excited that Ben Johnson and Lindsay Knudsvig have joined me in committing our labor to generate matching funds as part of Eric’s new NAWCA grant proposal. Visit the Volunteer page to learn more about how you too can make a contribution and subscribe to my iCalendar to get notified of all the upcoming volunteer workdays. 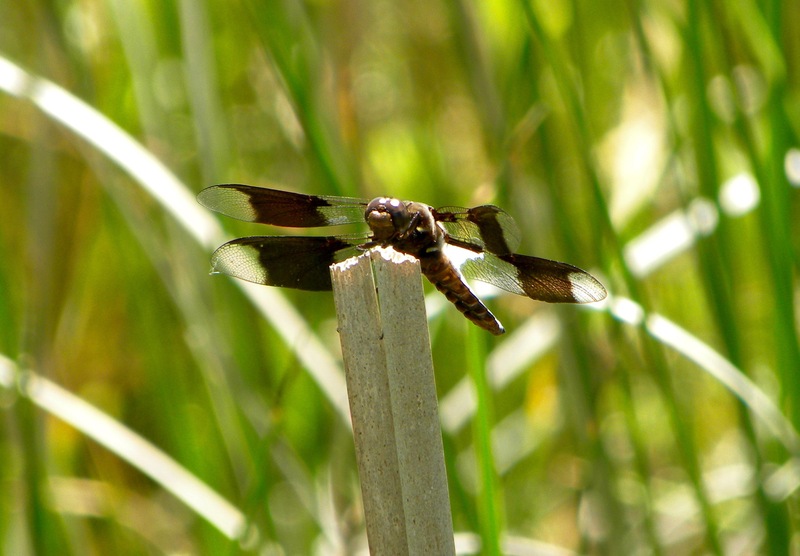 I recently published the Ottawa Lake Fen SNA Volunteer Project page on this site, so check it out for more details about the history of the land and the work done so far by volunteers and the Kettle Moraine Land Stewards, LLC. You are probably wondering what’s up with the thick black line on the map above. Ben Johnson called me last week and said his brother, Abe, was in town and we should go investigate the NAWCA grant area. That was a brilliant idea, and just my speed, as I’m still healing from surgery on my right hand for Dupuytren’s Contracture. We headed due west from the dog trial grounds parking area and made a loop over to the western boundary and then south and around Ottawa Lake. Deep in the buckthorn thicket. 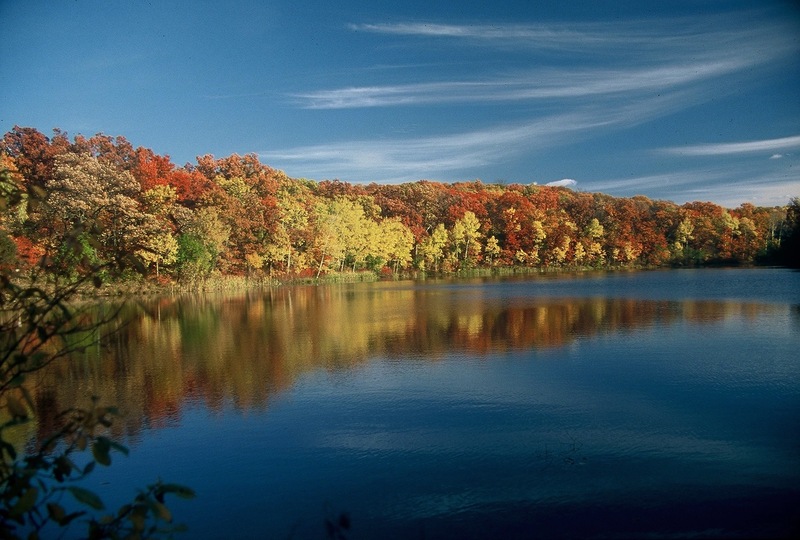 I experienced a happy coincidence on November 10, when I drove out from Milwaukee to cut some brush (one of my last workdays before the surgery) on the north end of the loop trail at The Springs, and noticed a plume of smoke rising near the visitor entrance to the Ottawa Lake recreation area. Burn boss, Don Dane, and his DNR crew managed to execute a few prescribed burns this fall season, and I caught them doing one in area #2 marked in green on the map above. I took a series of 4 videos capturing the conflagration that you can watch via the youtube playlist below. See you at The Fen! It’s been a while since we last heard from The Buckthorn Man. I’ve been laying low, or maybe laid low — a little of both I think. If you recall, I spent over 3 months during the late Spring and early Summer working on mold remediation and it may have been enough to save the house, but, I’m not sure about the home. I traveled bit and finally got back to work at The Springs in September with a sense of urgency. 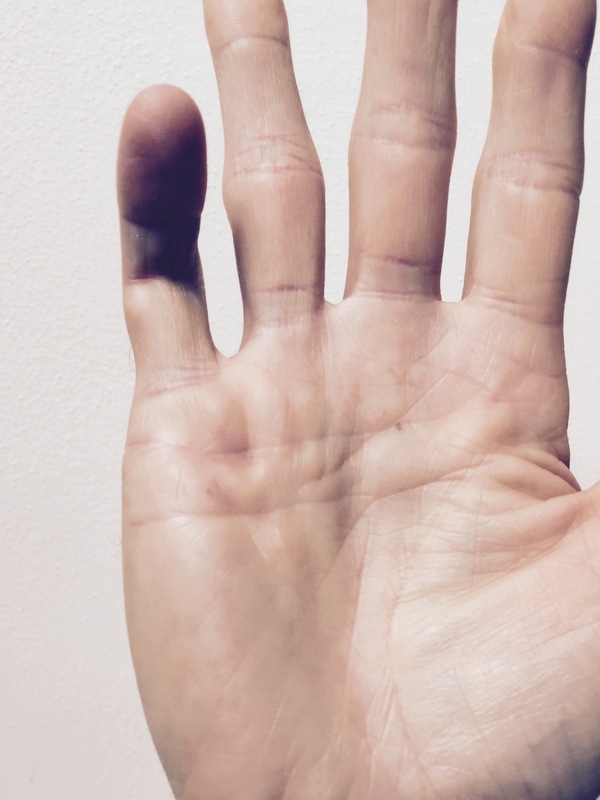 The symptoms of Dupuytren’s Contracture in my right hand got much worse over the last year and, with surgery scheduled in November, I tried to get a few projects done that have been on my mind for a couple years. 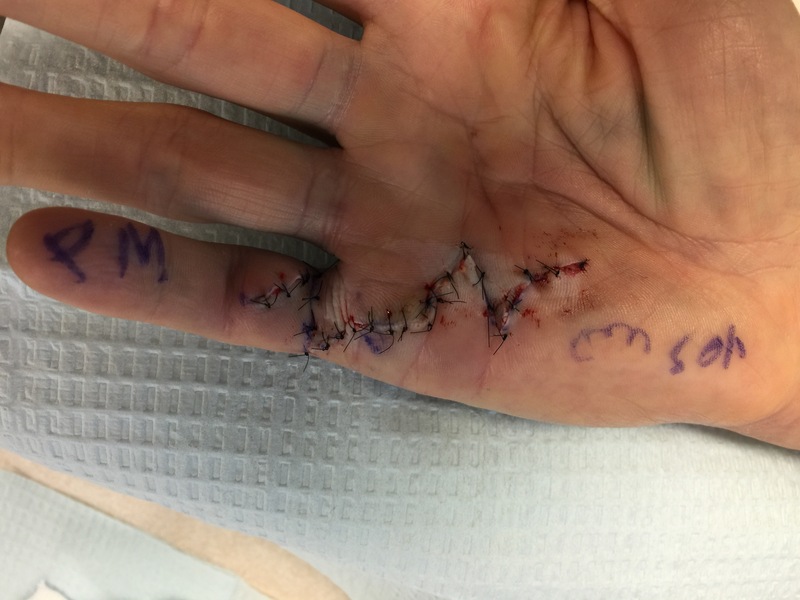 The surgery was a success and the scar will be good for many jokes about “the time I tried to stop my chainsaw with my bare hand.” I should be back to work in a few weeks. I wanted to be conscious during the operation and practiced a lot of bio-feedback using Heart Math and relaxation via Transcendental Meditation so I could stay calm and aware during the procedure. It was very interesting and I got a good look inside before they stitched me up. The first thing on the agenda was to build a new bridge over a drainage canal to make it easier to access the cut-off trail from the main trail. The area is circled in Yellow on the map below. 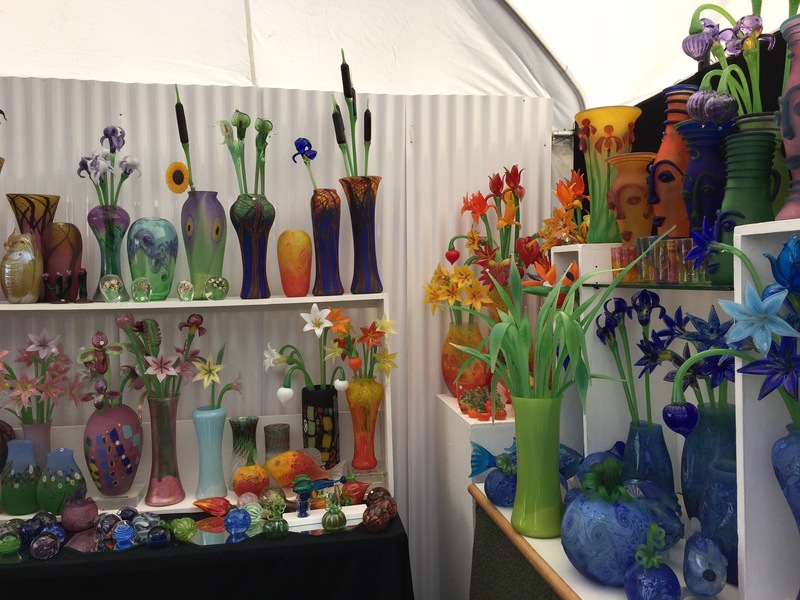 I hope you like the Gallery feature of the new website. Check out the story-line in the captions. near the marl pit factory ruins. The dam sprung a leak. Ben Johnson uses a dolly like some people use duct tape. I improved the trail while Ben applied the finishing touches. Next up was the little spur trail down to the Indian Spring that looked more like a gully (see the Blue circled area on the map above.) Rainwater was collecting on the trail above the spur trail intersection and washing the sand out. I did this project in two days: installing two water bars above the junction to divert the water off the trail and then, installing steps and water bars on the spur trail. Second water bar location, again where the downslope makes a turn. were used to start filling the gully at the spur trail junction. The lower of the two water bars. 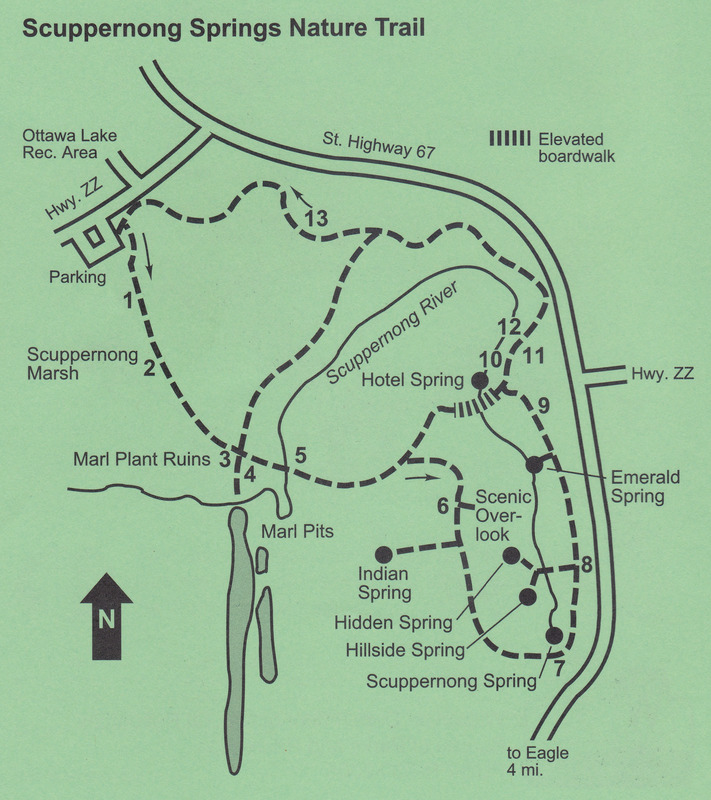 Scuppernong Spring and the Indian Spring. 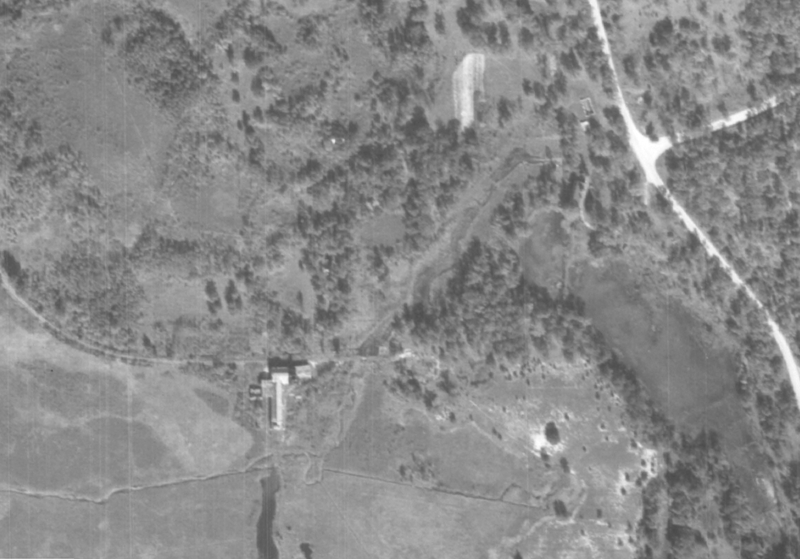 At the first location shown above. that leads down to the Indian Spring. and the site where the bridge was moved near the Hotel Spring. This could use one more step to bring it up to the height of the trail. of such a deep gully. Water bars going down the path. It has held up pretty well in the heavy rains we’ve had since I put this in. 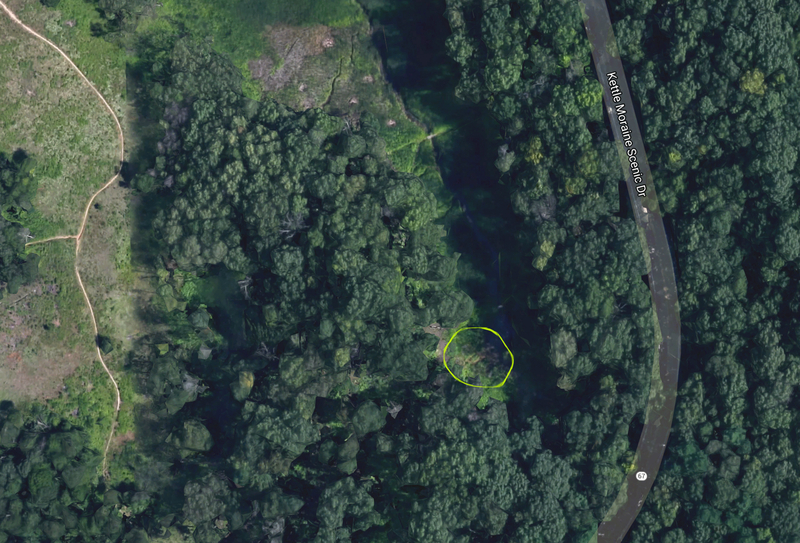 I have been wanting to lift this boardwalk out of the muck for years (see the area circled in Red on the map above.) 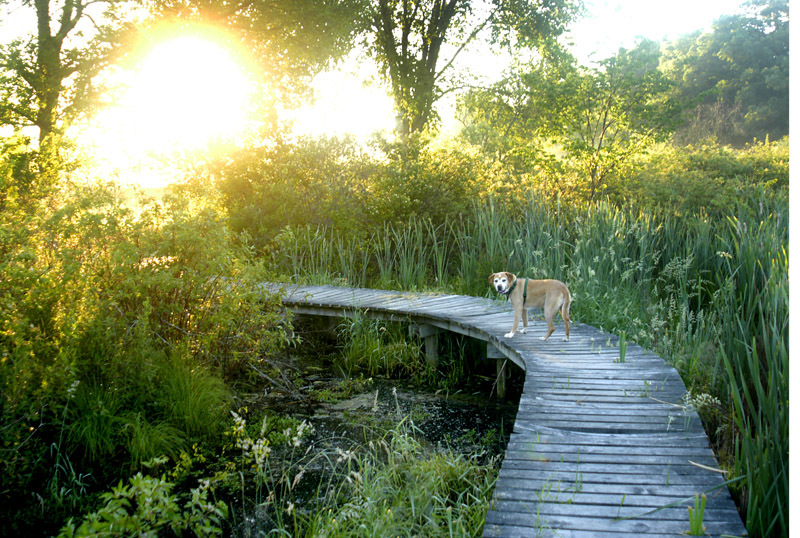 I was really inspired by the work that Ben Johnson led last year when we raised two boardwalks up out of the mud (read here and here) and I called on Ben again, and my old buddy Lindsay Knudsvig. We had a great time! This broken hickory would provide the pedestals needed to raise up the boardwalk. by a few inches during wet periods. Lindsay and I brought over the hickory logs. 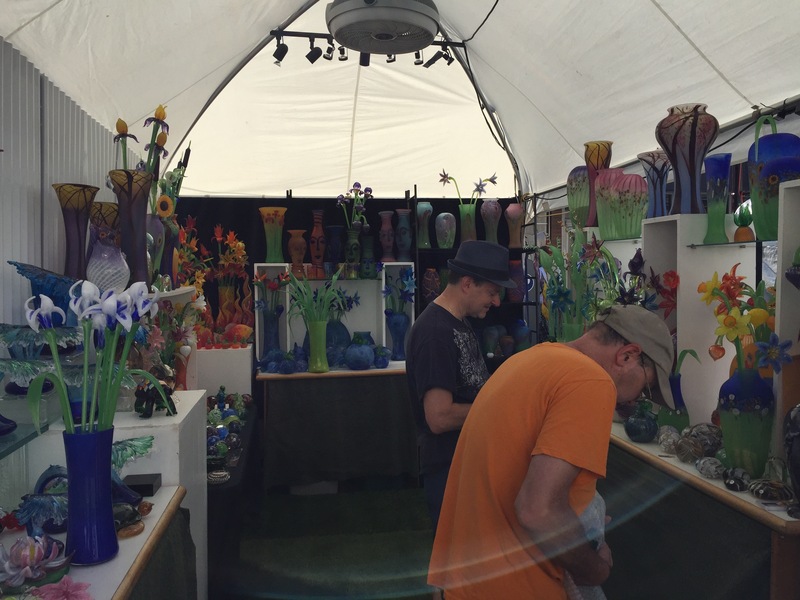 lay the 4″x6″ runners in. Well, I hope you like the new site. I won’t be posting much at the Scuppernong Springs Nature Trail anymore. This is my new home, so please do click the Follow button on the main page to get email notification when new stories are posted.